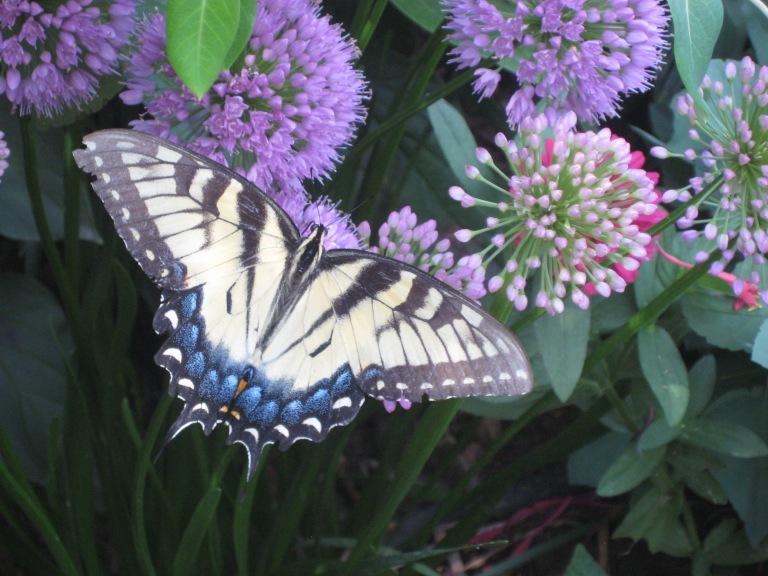 See photos and commentary on my garden for 2014. You hear me talk about my garden every month in the newsletter, so I thought I would show you a few photos so you could actually see what I am doing. I will periodically add new photos. 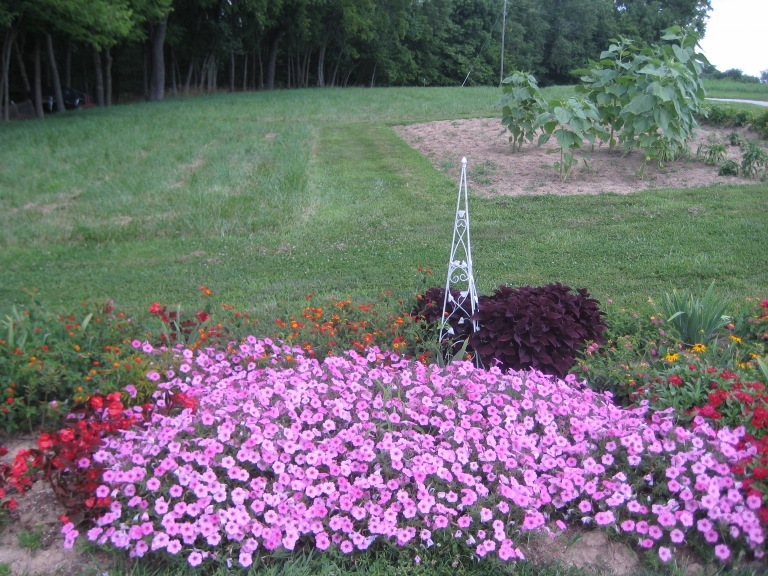 You can also see photos of my garden from 2008, 2009, 2010, 2011, 2012 and 2013. 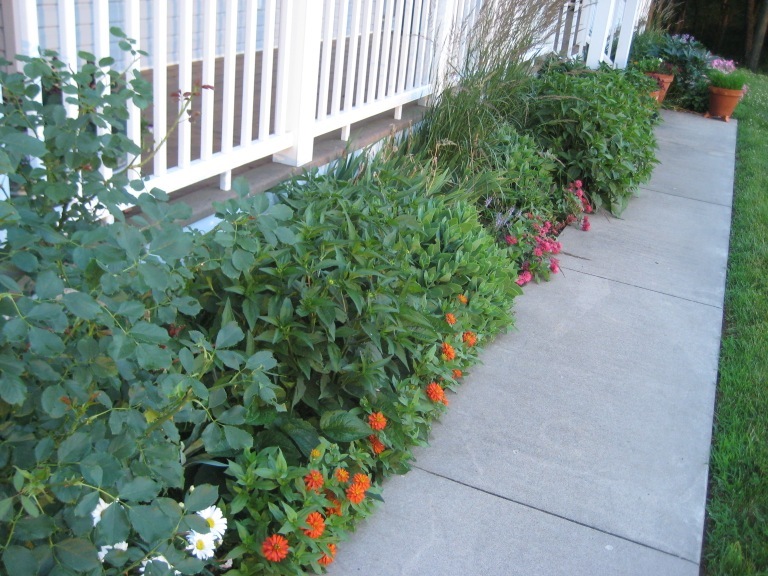 Please note that most of the plants in my containers will not be available at retail garden centers until spring 2015. 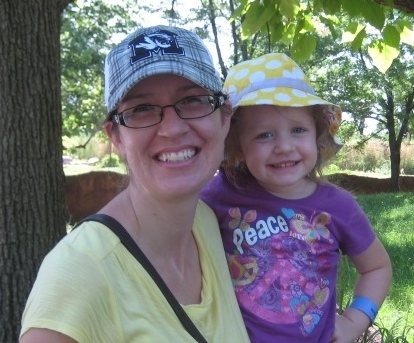 The photo on the left is of my daughter and I at the zoo in St. Louis in May of this year. This hawk is a recent phenomenon in my garden. 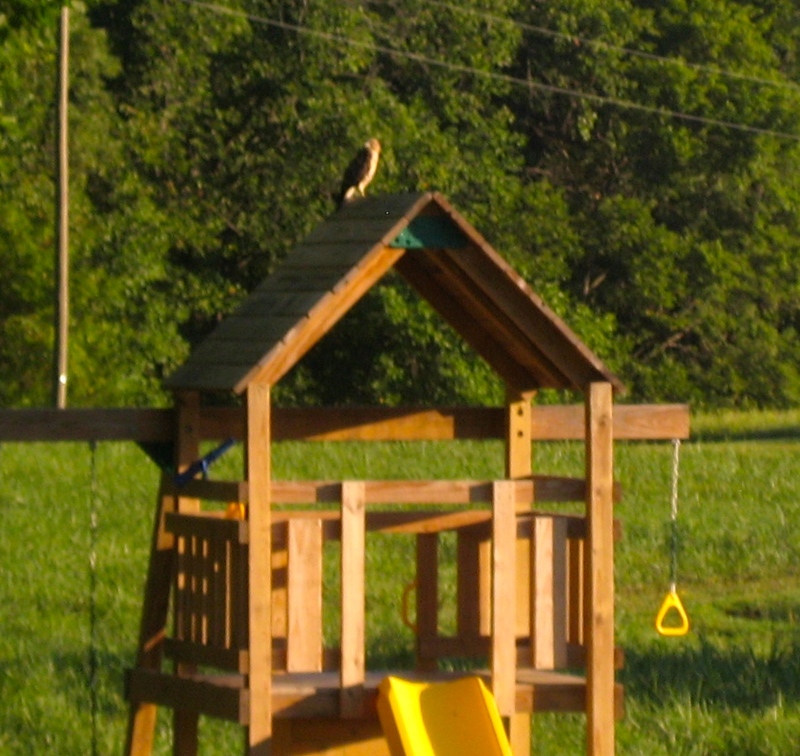 About a week ago, I first noticed this hawk perched on our daughter's play house. Since then we've seen it at least once a day, either in the morning or evening or both. We have certainly had hawks in the area all along, but this is the first time when we've regularly been able to see a hawk close up. And on a regular basis. It is visible from several windows in the house, along with the front porch. 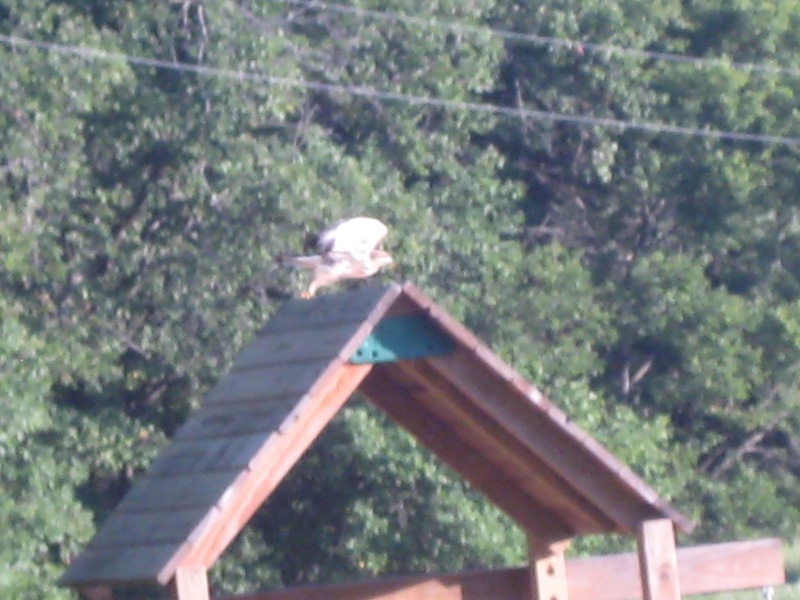 I believe it is most likely a Red-Tailed Hawk, which is common here in Missouri. I love this hawk! After all, what's not to love? Raptors are undeniably cool - I think we can all agree on that. Plus they eat small critters and I like the idea that maybe she (he?) is helping to keep the vole population under control. We have fewer mole hills in our yard this year. Coincidence? I'm not sure, but I think I am going to credit the hawk, until proven conclusively that it isn't true! I am NOT a good photographer, so you KNOW that the butterfly really landed and hung around for a while. Long enough for me to call our daughter over to come see, which she did by abandoning her swimming pool and riding over on her tricycle and taking a close look. 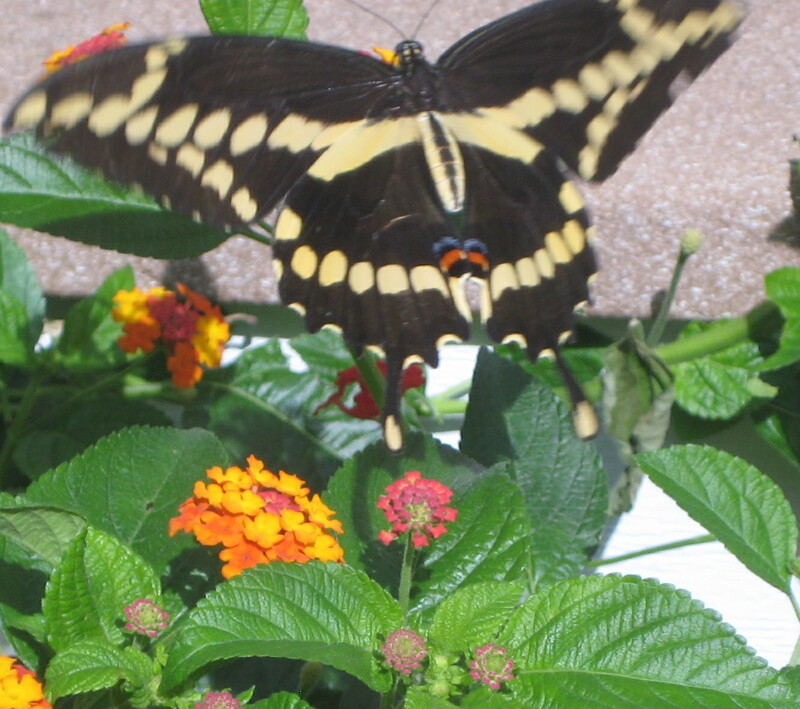 This one is an Eastern Tiger Swallowtail. 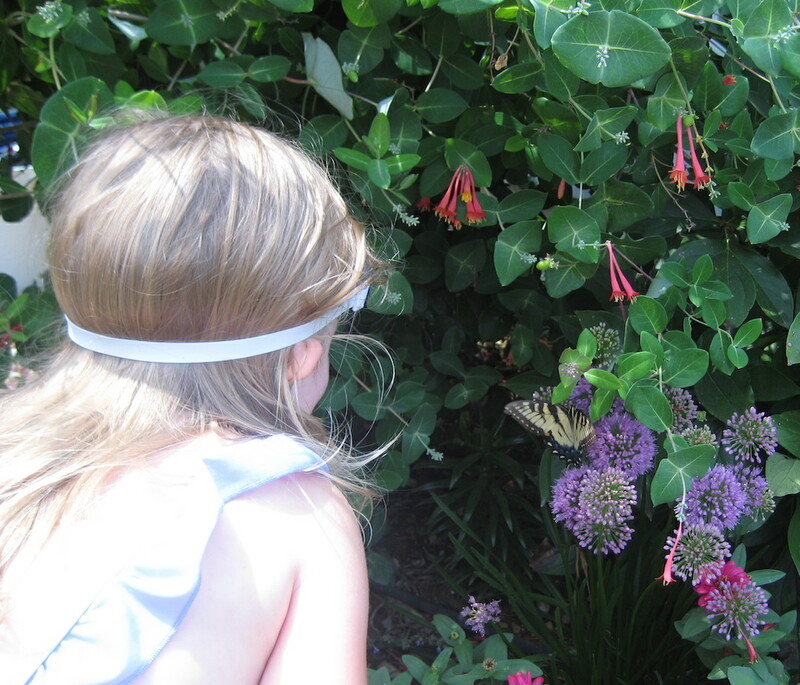 I wasn't able to capture photos of our resident hummingbirds, but I did get photos of two more butterflies - the one on the left was still enough, long enough that Miranda was able to gently touch it - which thrilled her. 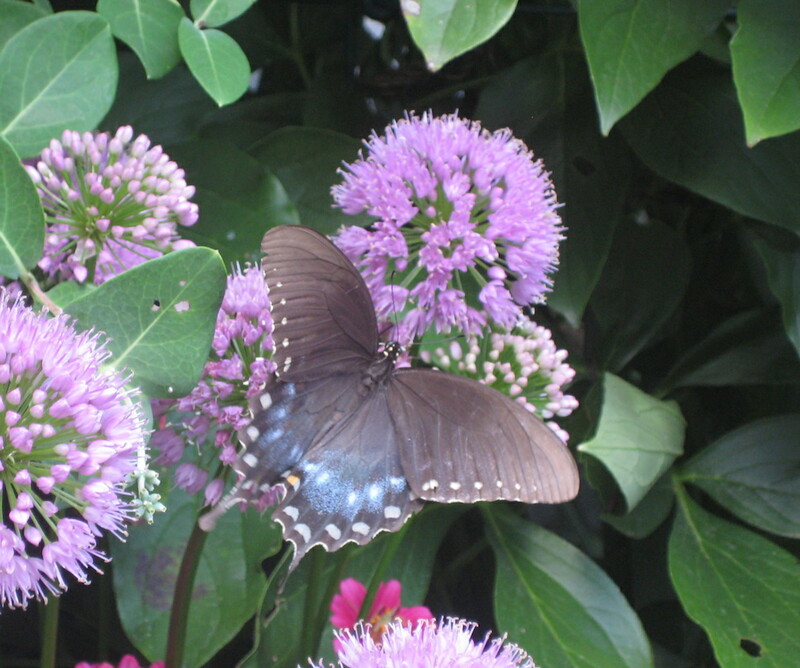 It is a Spicebush Swallowtail. The butterfly in the middle, a Giant Swallowtail, was unable to sit still long enough for me to get a really good photo, but this one wasn't bad. 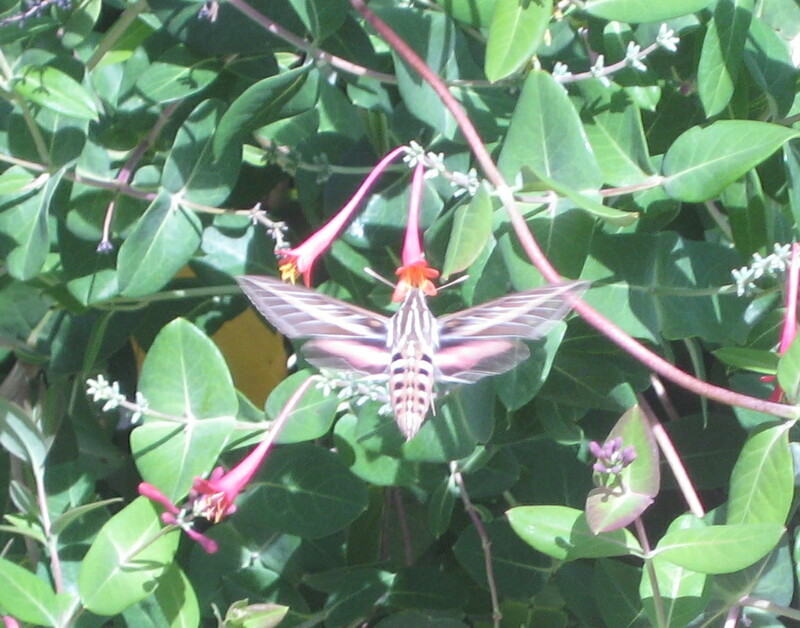 The photo on the right is of a hummingbird moth, which is as close as I got to getting a picture of a hummingbird! The containers are doing well. This is a very odd looking combination right now. 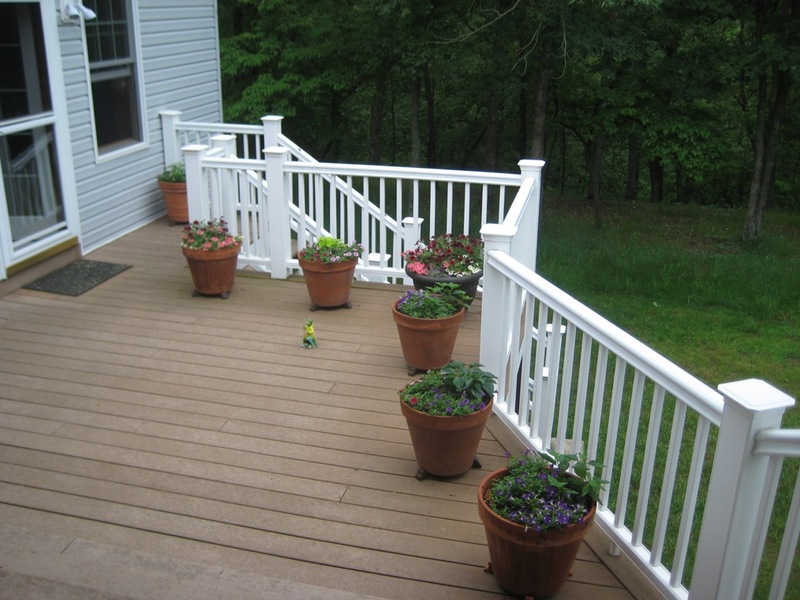 We had a very heavy rain storm that knocked over most of the ColorBlaze® Lime Time™ in this combination. As usual, I tend to lean towards Darwinism and the survival of the fittest when it comes to my plants. I was going to trim this one back to tidy it up, but instead decided to wait and see what happened. The photo on the left was taken a few days after the storm and you can see that small branches are already starting to grow along the prostrate stems. 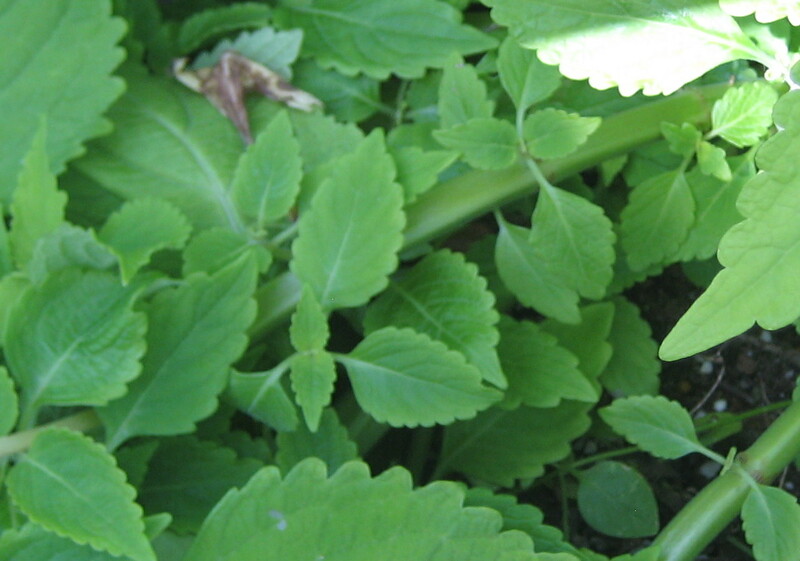 The photo on the right shows that those stems are already several inches tall. The photo on the right is my favorite bed right now. It is literally overflowing with color. The same storm that caused the ColorBlaze® Lime Time™ to topple also had the Senorita Rosalita® lodged over the Snow Princess® in this bed. I wanted to give the Snow Princess® a better chance to keep looking good, so I did go ahead and trim back the plants. By next time they will be back in full bloom, better than ever. Summerific® 'Cherry Cheesecake' Hibiscus is looking great. The flowers are huge, more than 6-inches across. The large bed is doing well, too. This month I am going to concentrate on my in-ground beds, but the containers are looking great as you can see from these photos. I just this week started to use water-soluble fertilizer to augment the controlled release I used when I planted them in May. Now, on to the beds. This is the bed next to the kitchen steps. This one didn't turn out quite like I expected. It's not bad but I think I would like it better with Zahara Orange or Profusion Double Orange instead of the Cherry color. This bed has 3 Snow Princess® Lobularia, 3 Luscious® Citrus Blend™ Lantana and 10 Zahara Double Cherry. It has filled in wonderfully, but it is a bit messy. It's fine enough, but I don't love it. 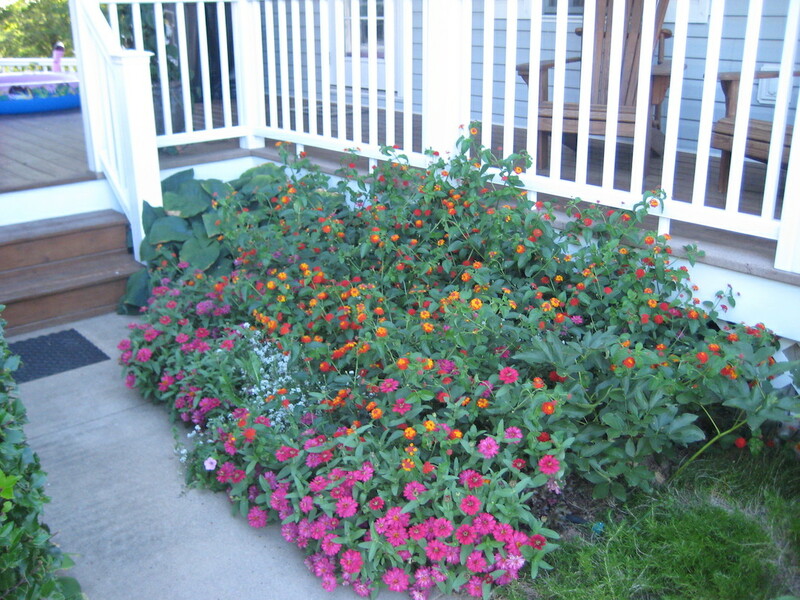 This is the bed to the left of the front steps. 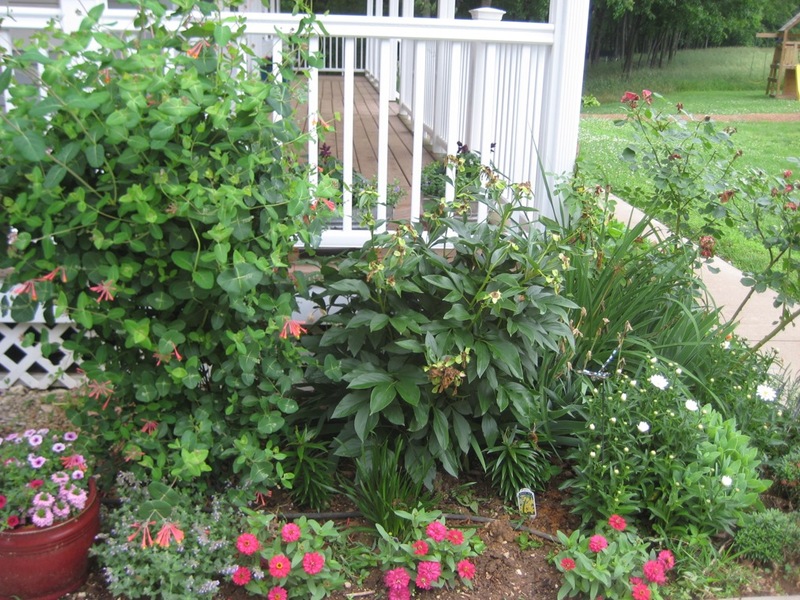 It is only 3 feet deep and has quite a few established perennials - too many really. 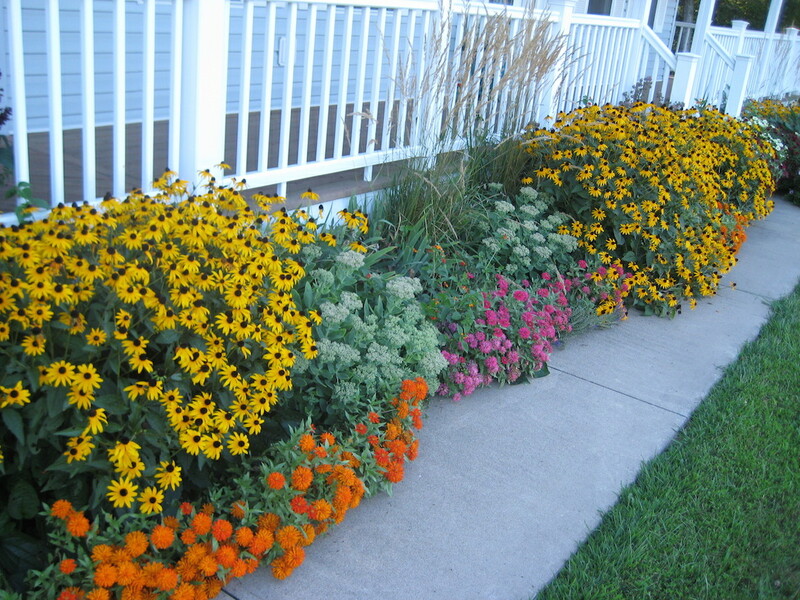 I love the Goldsturm Black-eyed Susans (my daughter calls them tiny Sunflowers) and Neon Sedum. 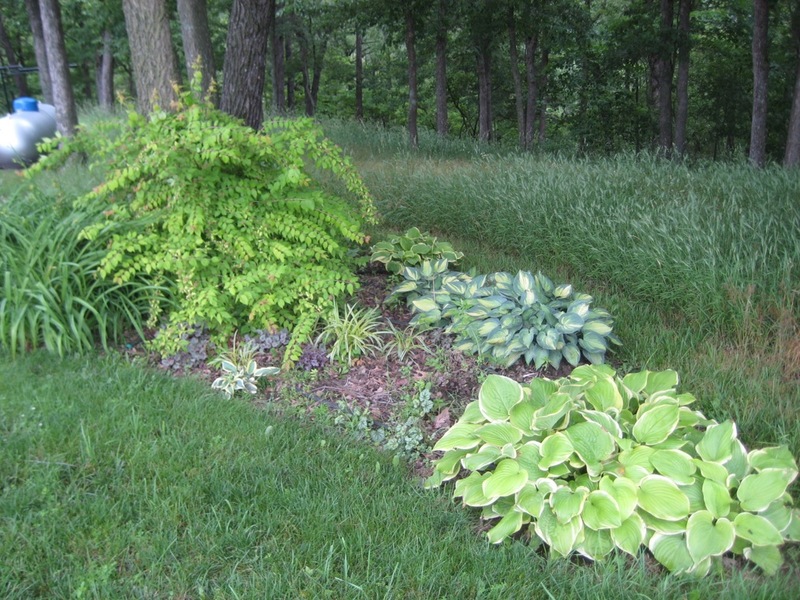 I also love the Forester grass but I don't think it works in this space. 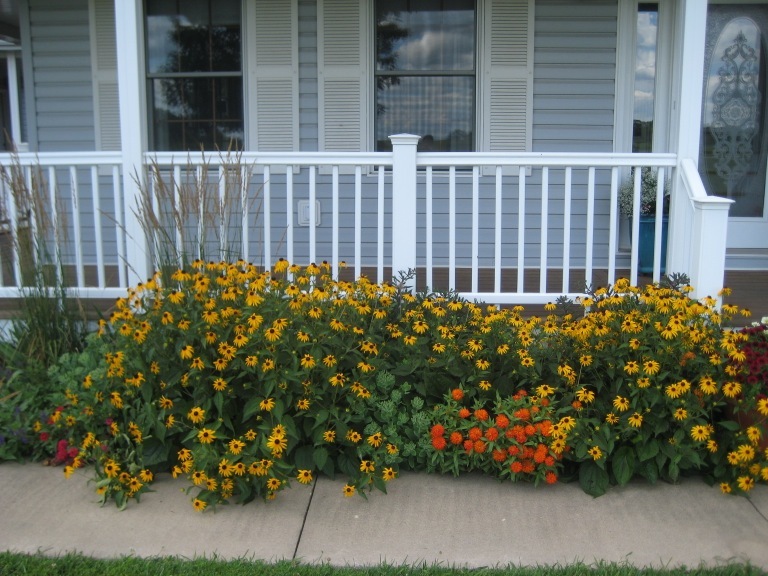 The Black-eyed Susans I plan to thin out this fall, with some of them moved to the big bed by the veggie garden. The Karl Forester I plan to simply move, maybe to the bed on the other side of the steps. I'm not sure. 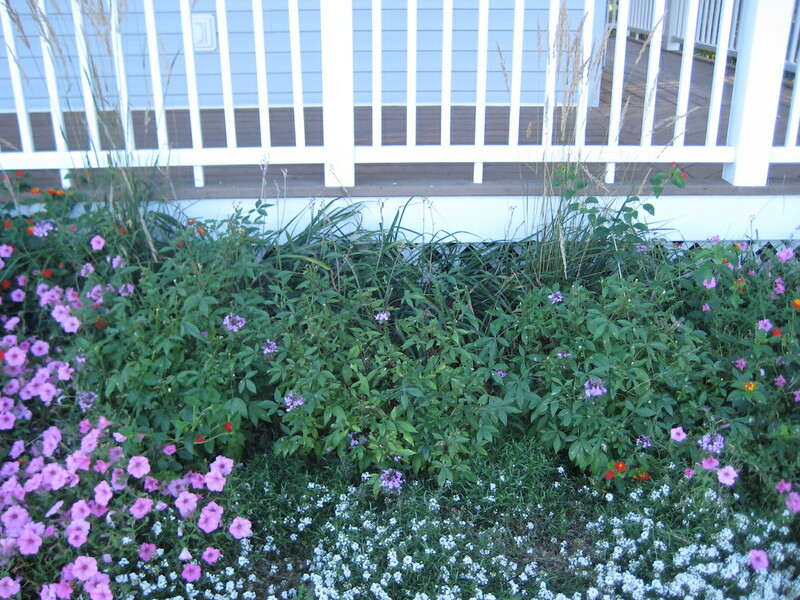 I have in years past, put spreading annuals in this bed to fill things out, but finally realized that the space is too small. 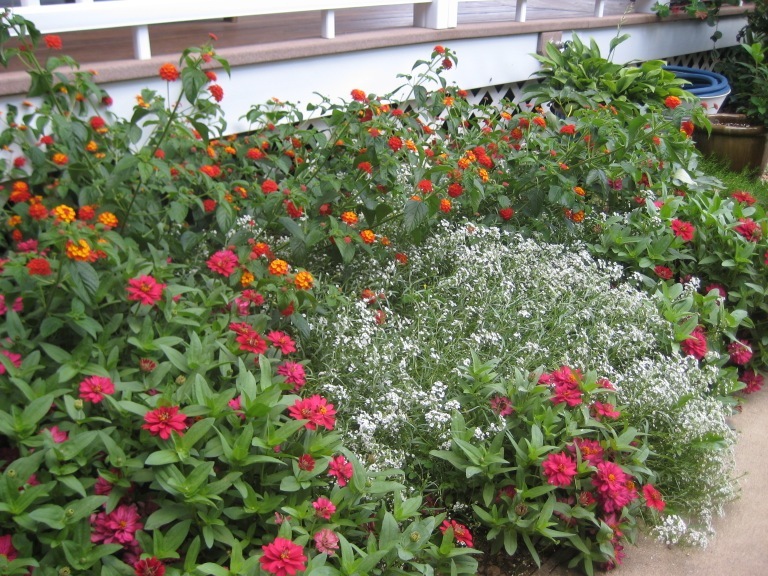 Zahara or Profusion zinnias, on the other hand, are perfectly sized to fill in the bed edges. Right now with the Black-eyed Susans in full bloom it is pretty spectacular. 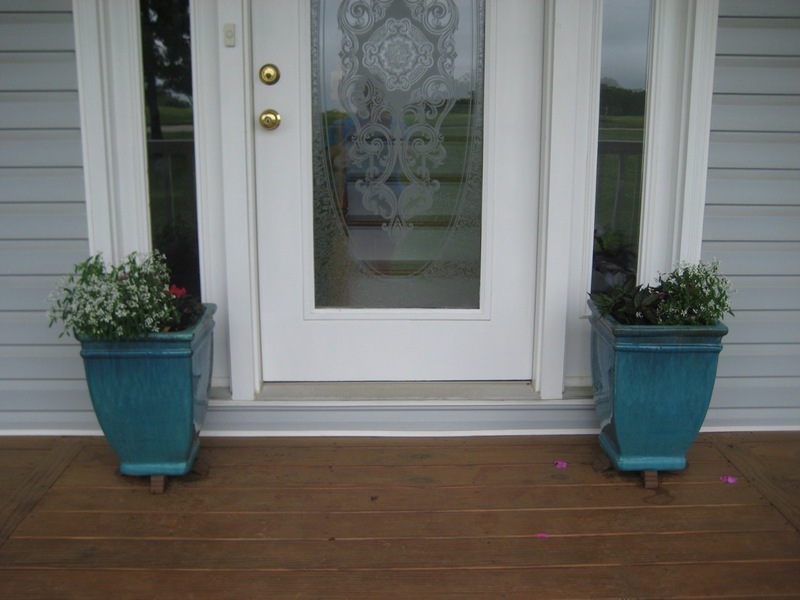 The photo on the left is of the front steps, you can see several containers that have also filled out well. The other two are of the bed to the right of the front steps. I didn't intend these two beds to be so different in color palette, but that is how they turned out. 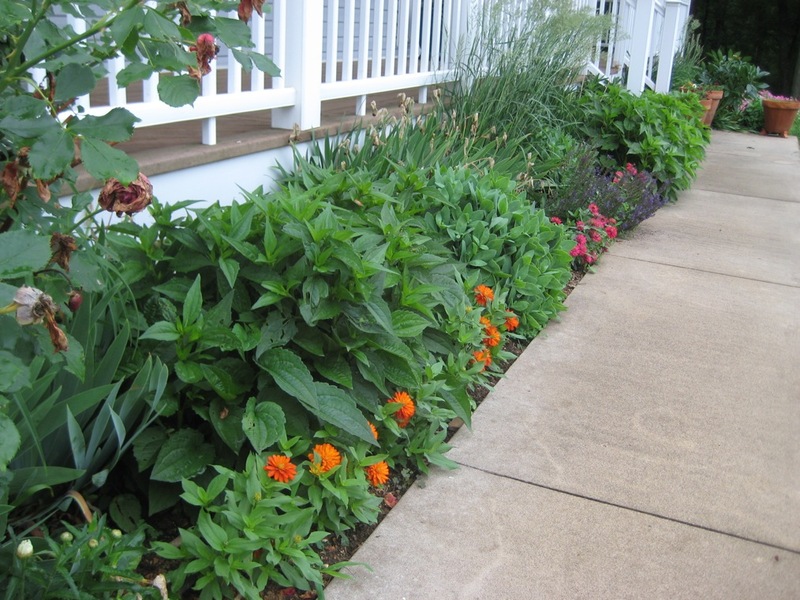 This bed includes 6 Luscious® Citrus Blend™ Lantana, 6 Supertunia® Vista Bubblegum® Petunia, 3 Senorita Rosalita® Cleome, 3 Snow Princess® Lobularia and 12 Zahara Fire zinnia. 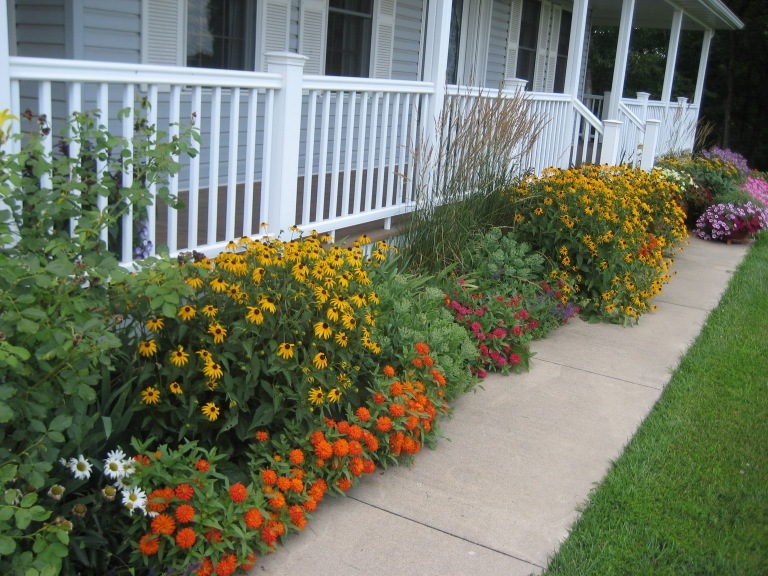 Plus Goldsturm Rudbeckia and Karl Forester grass. I also planted a new shrub in this bed - Bangle® Genista. 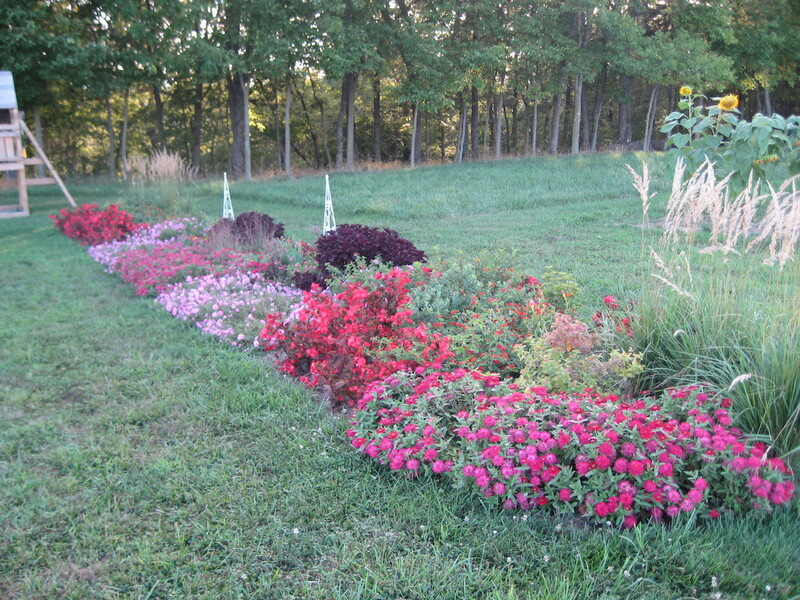 Although I love the color in the large bed I redid last fall (50 by 8 feet) it is still missing one element. It needs more height. 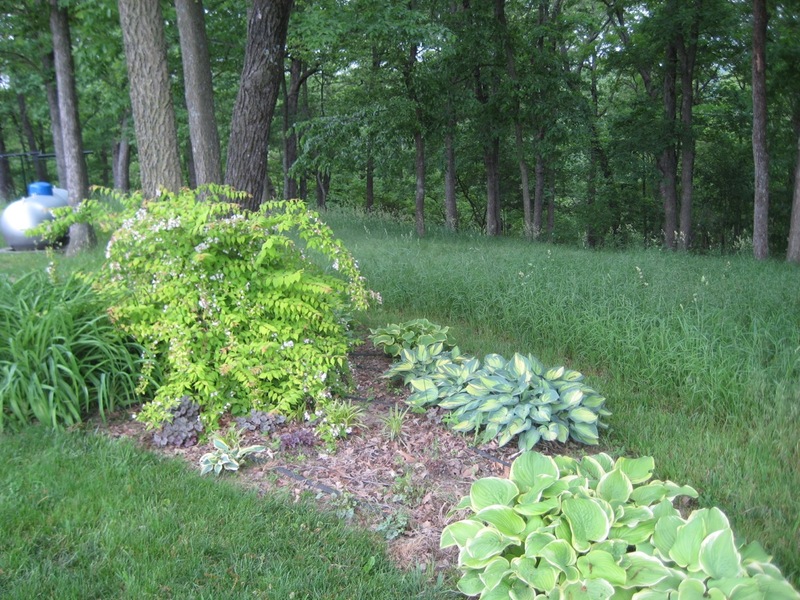 I am working to add a backbone of shrubs at the back of the bed, so that this can once again function as a marker for the edge of the yard. It will take some time for them to fully develop and I still need to add more. 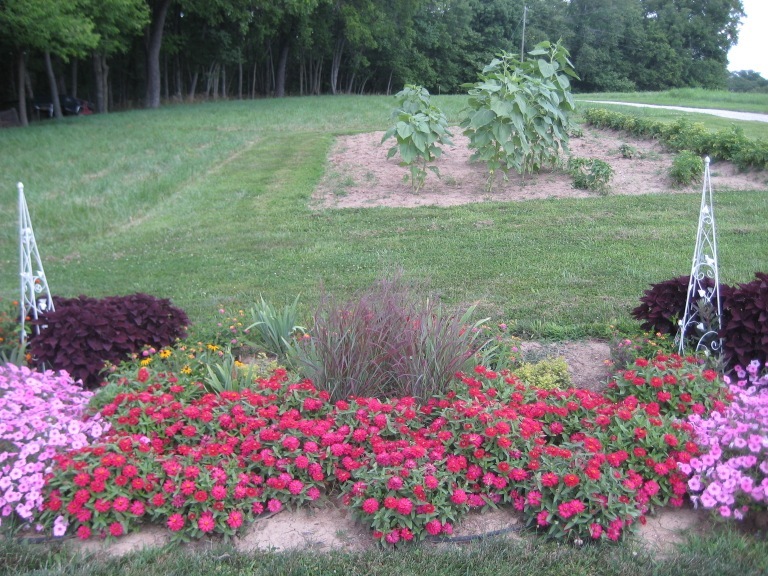 So this bed for the year has 10 Supertunia® Vista Bubblegum®, 24 Surefire® Red begonias, 6 ColorBlaze® Marooned™ coleus and 36 Profusion Neon Cherry zinnia. 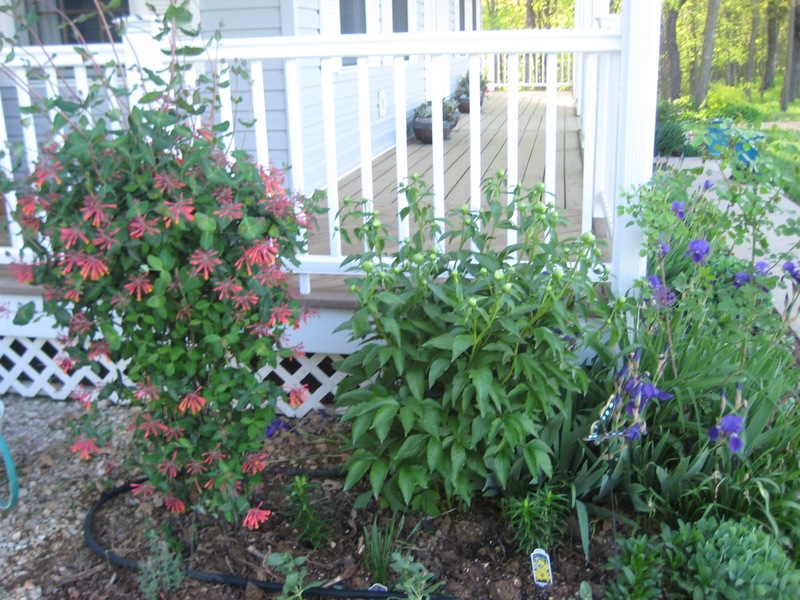 I also added several shrubs and perennials: 2 'Sweet Summer Love' clematis, 2 Decadence® 'Lemon Meringue' Baptisia and 2 Sonic Bloom™ Pink Wiegela. Below are three more photos of the bed. The photo to the left above is the whole bed, the others start at the upper edge and work their way down to the lower end of the bed. In addition to the new plants I added this spring this bed also includes 10 Karl Forester grasses, 3 Panicum 'Cheyenne Sky,' 2 'Miss Molly' Buddleia, 2 Double Play® Big Bang and 2 Glow Girl® Spirea, and 1 each of All That Glitters™ and All that Glows™ Viburnum. I never tire of looking at the sky. This is the view from our front yard this morning. 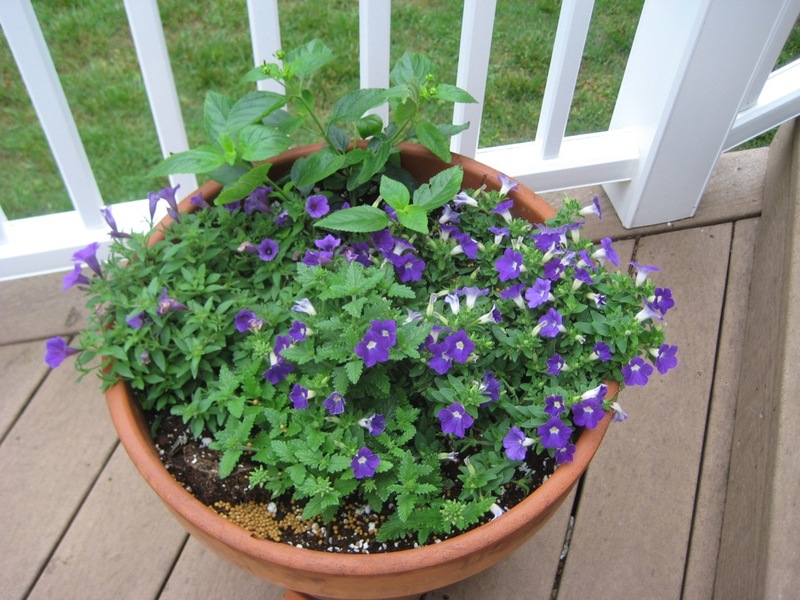 Two weeks can make a huge difference in plants, especially when the weather turns warm and sunny. My containers are filling out nicely, but where you REALLY see the growth is the beds. 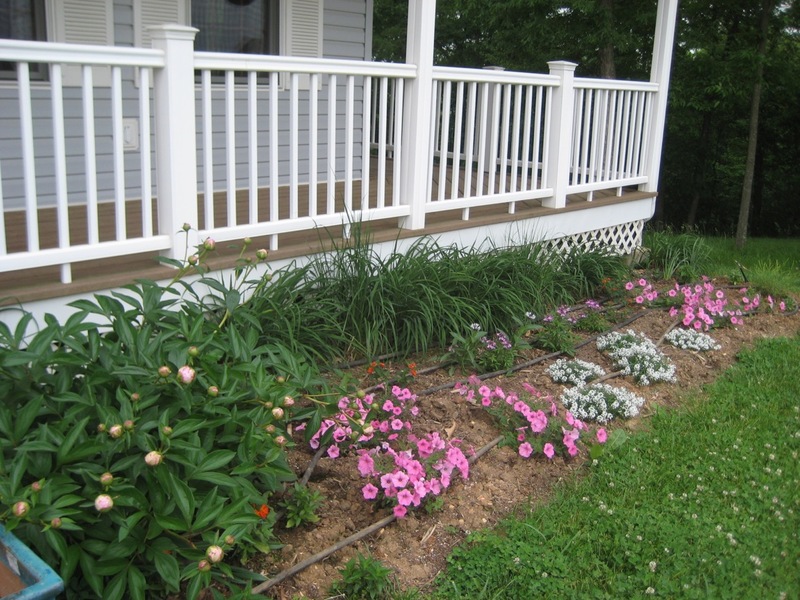 Here are some of the beds around the porch. 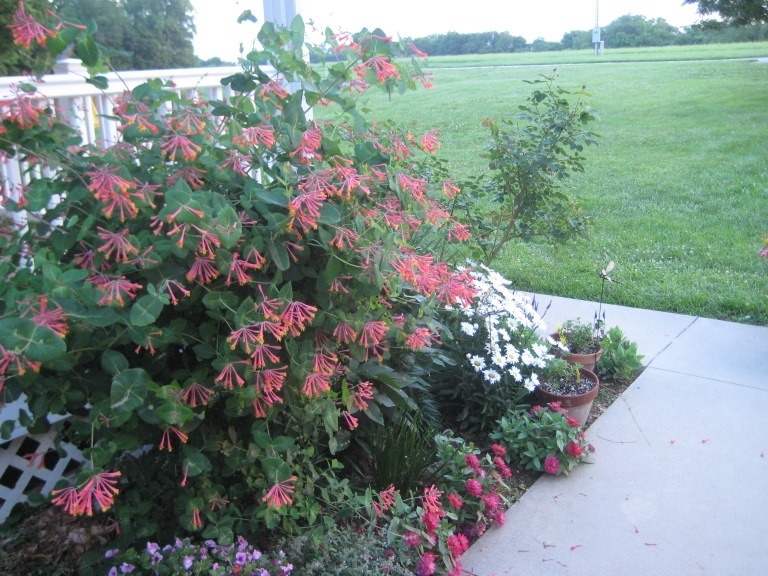 The middle photo shows the honeysuckle bush, who needs a hummingbird feeder when you have a honeysuckle bush? Once it starts blooming, it never takes more than 5 minutes of sitting in a chair on the porch to see the hummingbirds buzz the bush. It will bloom pretty much all summer, too. 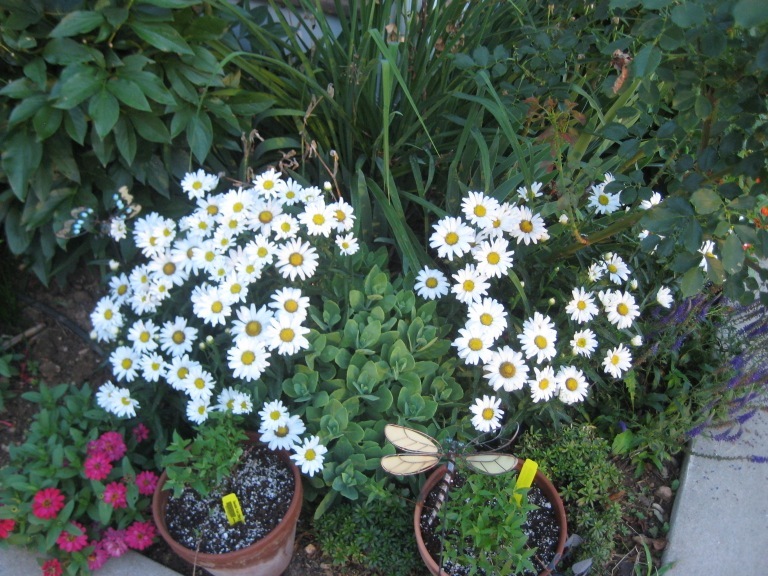 On the right, is a close up of my Amazing Daisies™ Daisy May®. These have been a mainstay for this corner for the past three years. 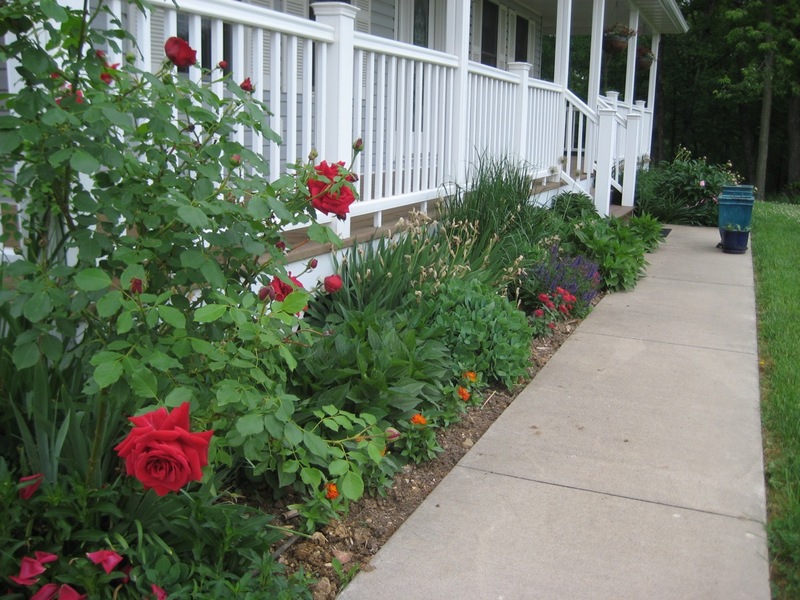 They look good this year, but suffered a bit with the harsh winter and took a bit of step backward. 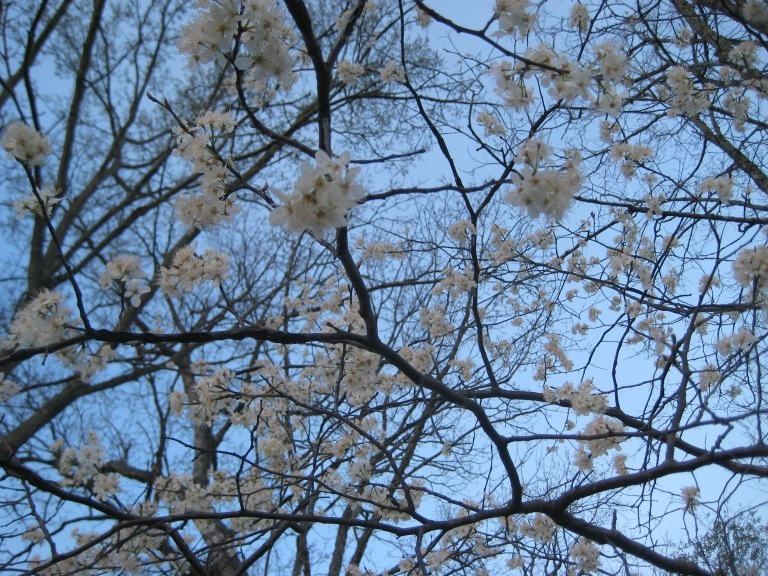 However, since they are back and blooming they should be back to where they were before next season. 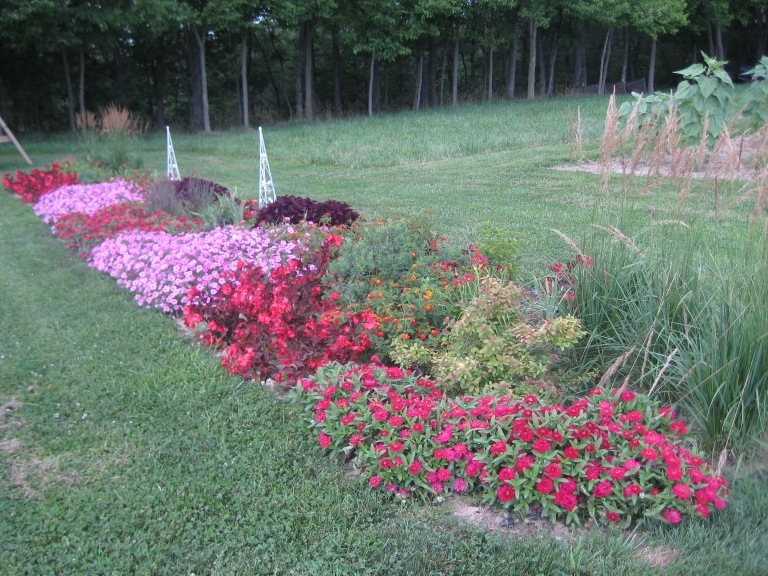 The main flower beds are really filling in. Ok, before we start today, let me make a couple of points about my garden. It is a true home garden. If it's been dug, planted, divided, weeded, hoed, pruned, watered, deadheaded etc... there is a 99% likelihood that I am the one who performed the task. 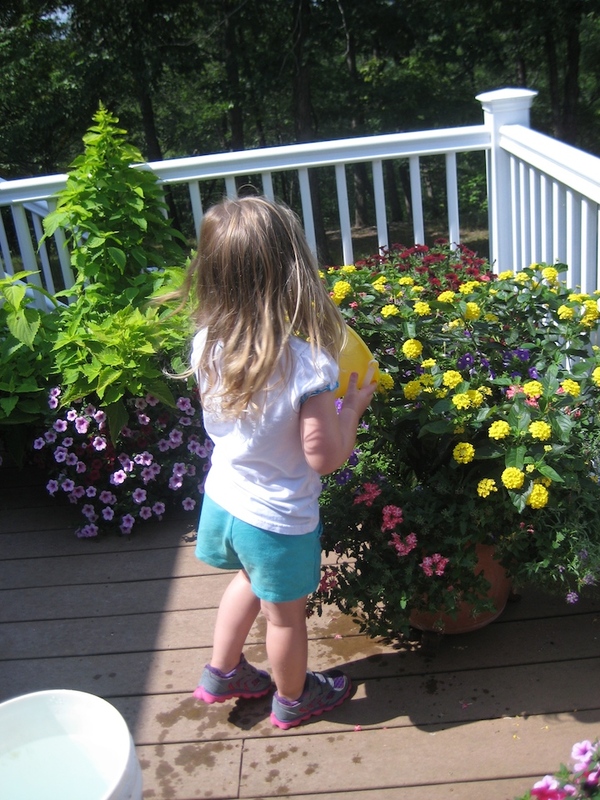 I try to get my almost 3 year old interested, but her attention span maxes at about 10 minutes and I spend most of that time trying to make sure she pulls weeds, not flowers or that she doesn't step on a flower in her, short-lived, enthusiasm to pull the weeds. Her favorite activity is watering, because she gets to play with water, of course. Even then she's good for about 10 minutes and it is as likely that she watered the grass as it is she watered the planters. Like, many of you both my husband and I work full time, so mowing (him) and garden maintenance (me) happen almost exclusively on the weekends. The newsletter goes out on Friday and my garden photos are usually taken on Thursday or Friday. So, if you think the grass looks shaggy and that you see weeds, you are most likely right. One of these days I'll take photos on Monday when the beds are newly weed-free and the yard is neatly mowed. Until then, please overlook the weeds and over-grown grass:-) Ok, on to plants. This time I am going to focus on my containers. Most have been planted about 2 weeks, two of them are about 4 weeks old. As usual, the containers are planted with items that won't be available at retail until spring 2015. For the first time this year, we are showing our newest varieties on our website as a preview before they are available in garden centers. So I will actually be able to link to the varieties as I introduce them to you. 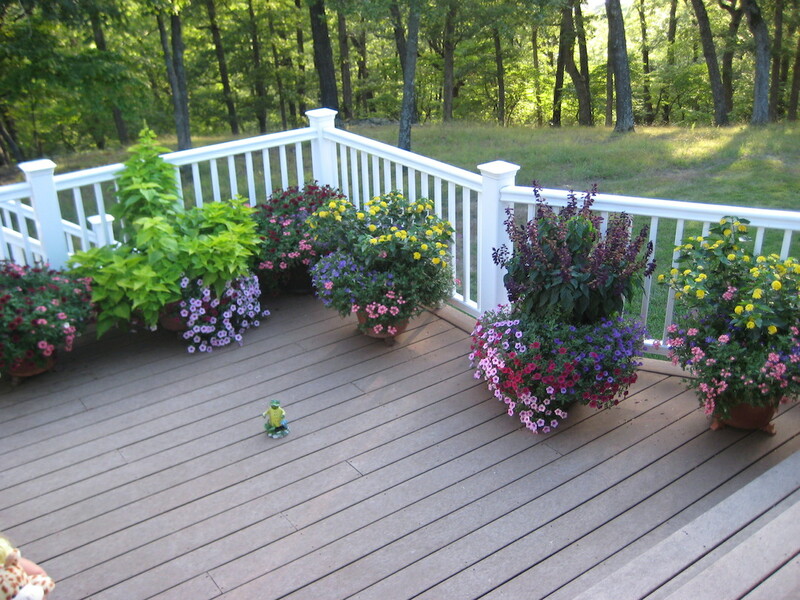 The photo on the left shows the deck with 7 containers. 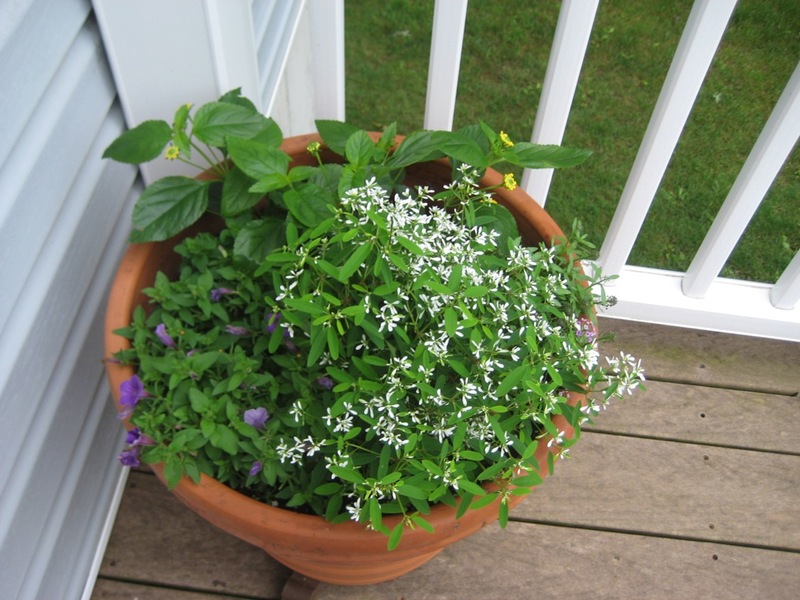 I've distributed my planters a bit more widely this year, rather than having them primarily on the deck. 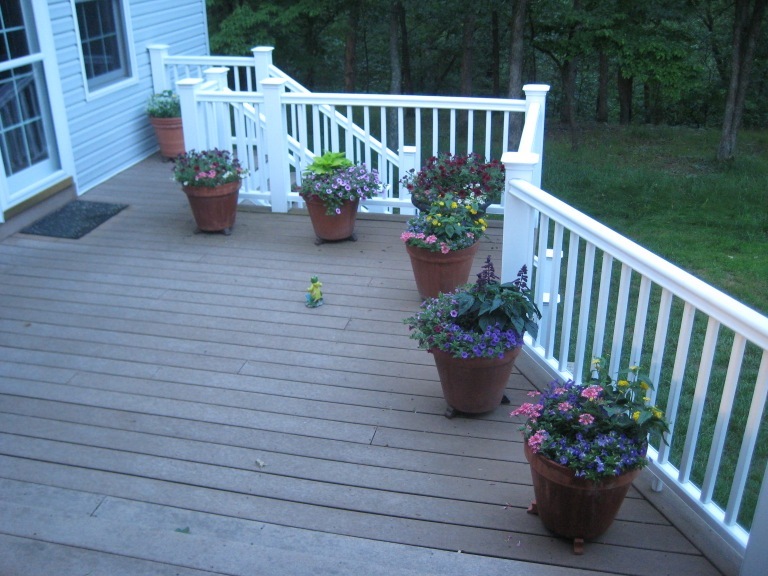 I will show the planters moving from left to right, from the overview photo. 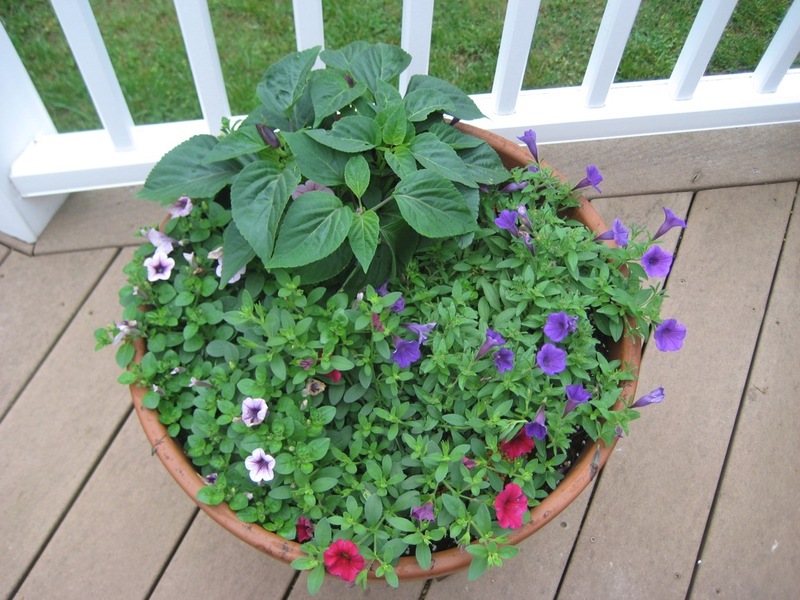 The middle photo: contains one plant each of Luscious® Bananarama, Supertunia® Morning Glory Charm, Supertunia® Indigo Charm and Superbena® Royale Cherryburst. Combo on right, again one plant each: Ablazin'™ Purple, Supertunia® Indigo Charm , Supertunia® Mini Rose Veined and Superbells® Cherry Red . 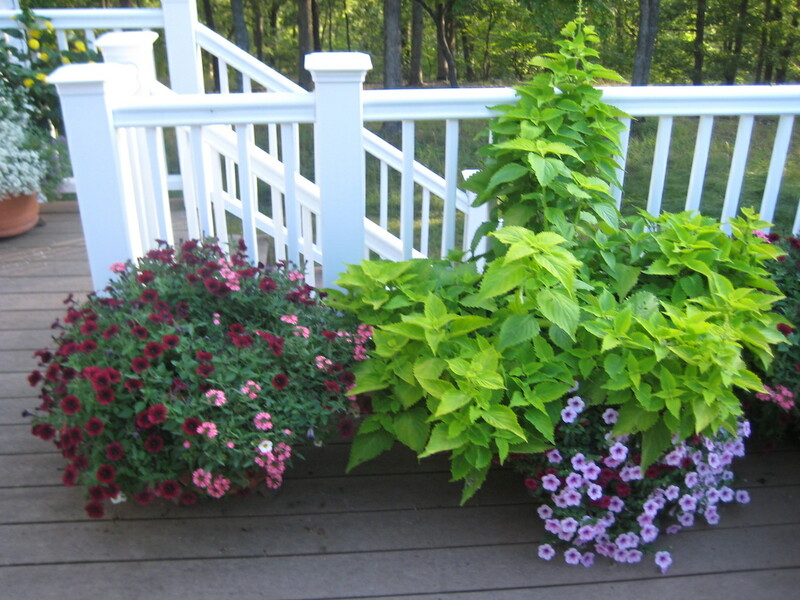 Left, one plant each: Luscious® Bananarama, Dark Knight™, Supertunia® Morning Glory Charm and Superbena® Royale Cherryburst. 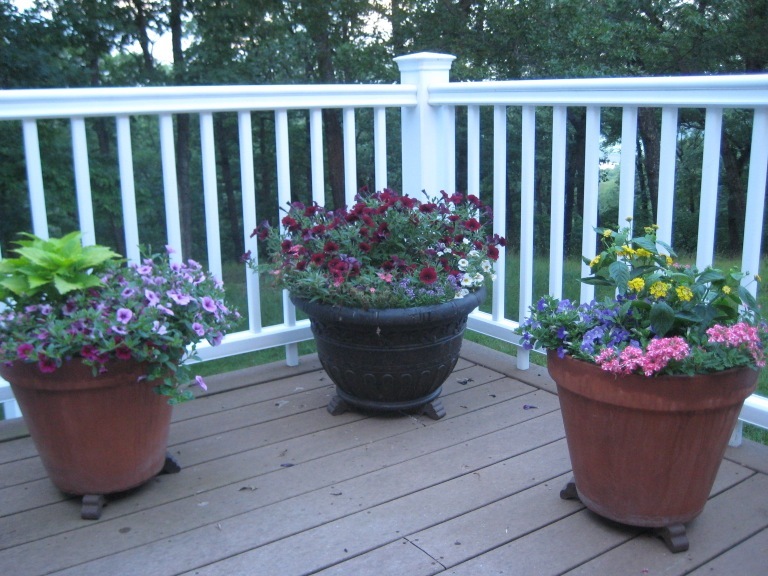 Middle, one plant each unless specified - planted for 3 weekw: Supertunia® Black Cherry - 2, Superbena® Royale Cherryburst, Dark Knight™ and Superbells® Frostfire. 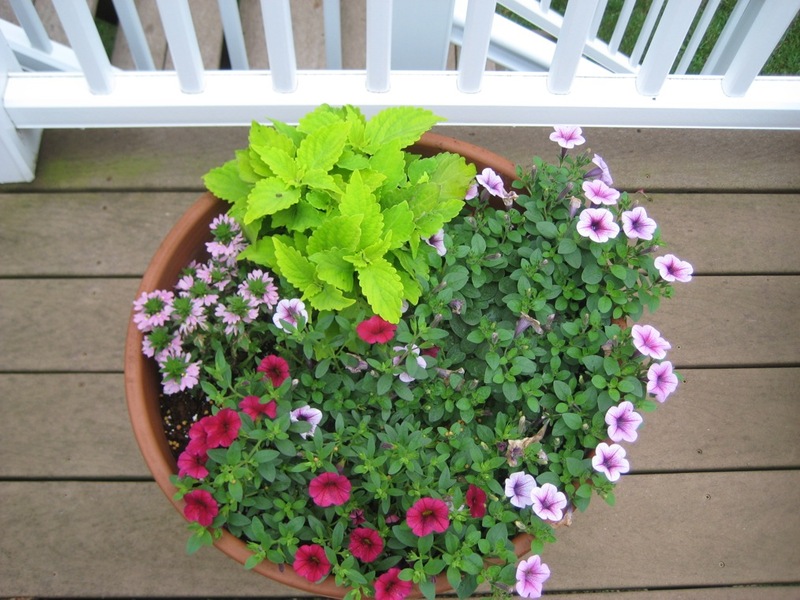 Right, one plant each: ColorBlaze® Lime Time™, Pink Wonder™, Superbells® Cherry Red and Supertunia® MiniRose Veined. 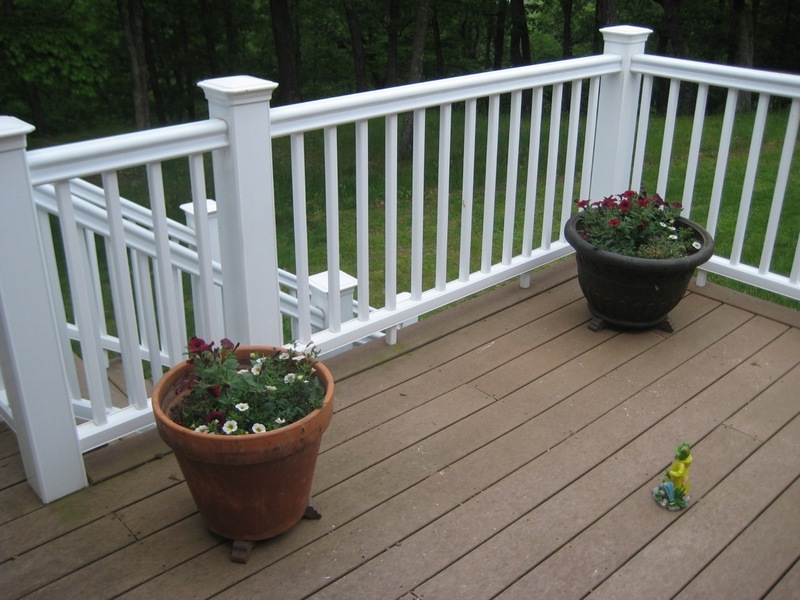 These are the last two combinations on the deck. 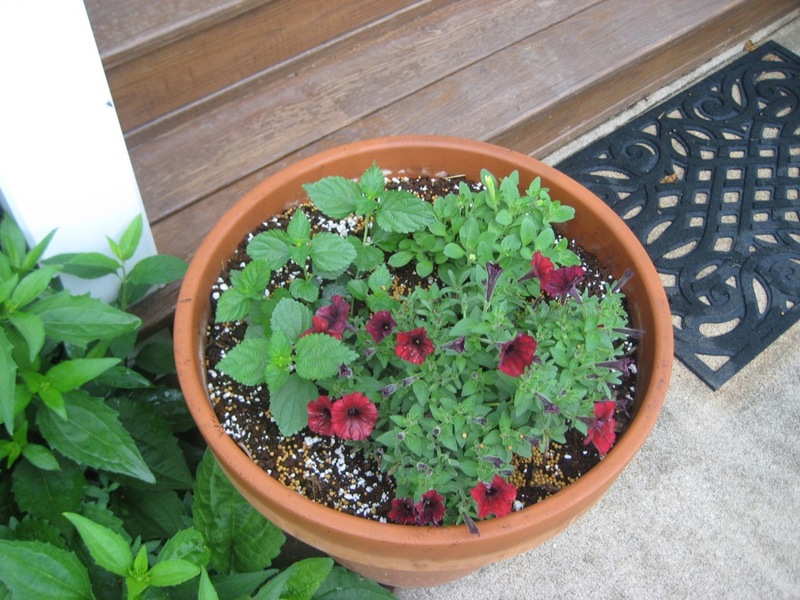 Left, one plant each unless specified - planted for 3 weeks: Supertunia® Black Cherry, 2 Superbells® Frostfire, Superbena® Royale Cherryburst. Right,one plant each: Diamond Delight™, Supertunia® Indigo Charm , Dark Knight™ and Luscious® Bananarama. 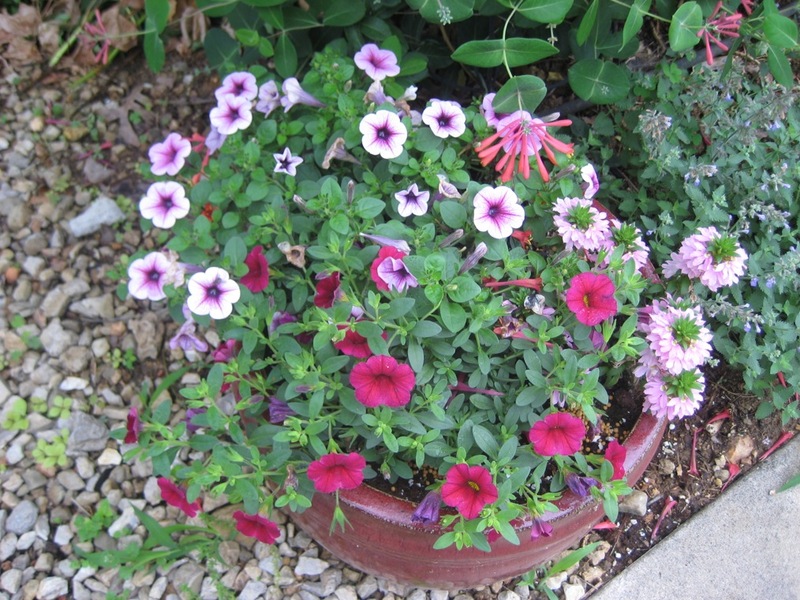 Left, one each: Pink Wonder™, Superbells® Cherry Red and Supertunia® Mini Rose Veined . 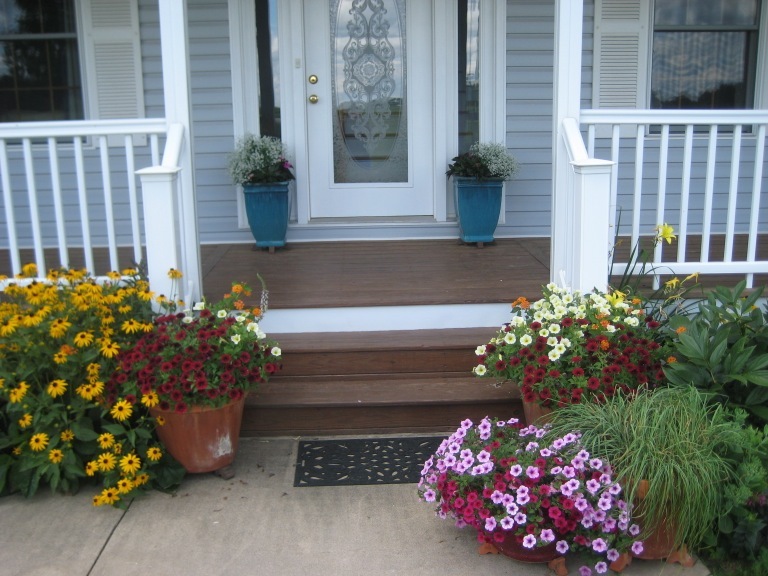 The middle photo shows the shade containers flanking the front door. 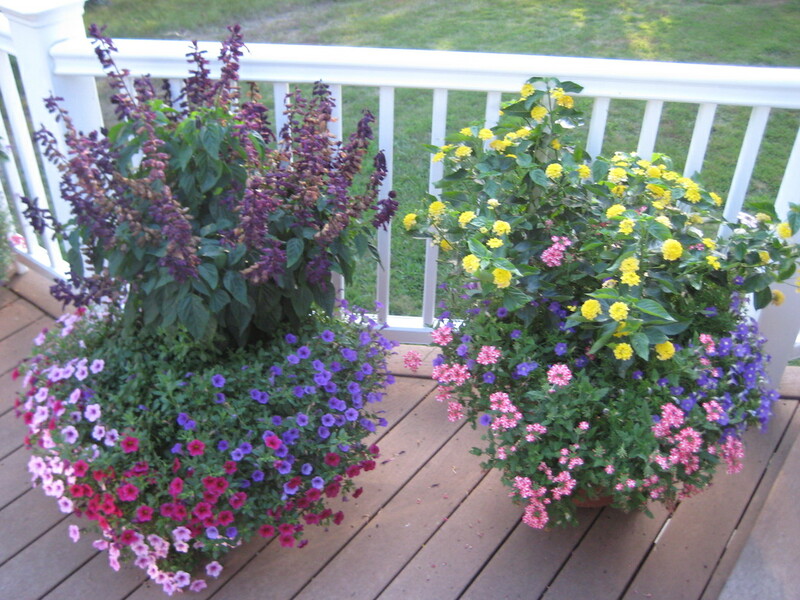 The photo on the right shows what each of the two planters contains, one plant each of: Diamond Delight™, Infinity® Red and Ruffles™ Lavender. All three of these containers include one each of the following: Supertunia® Black Cherry, Supertunia® Limoncello and Luscious® Marmalade. The left container also includes Superbells® Frostfire. Ok, on to the beds. 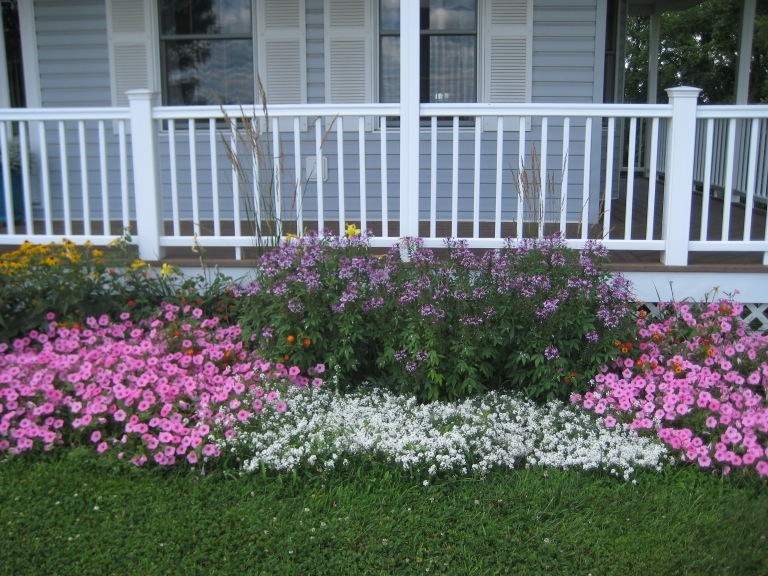 These are the beds to either side of the front steps. They are coming in quite nicely too. 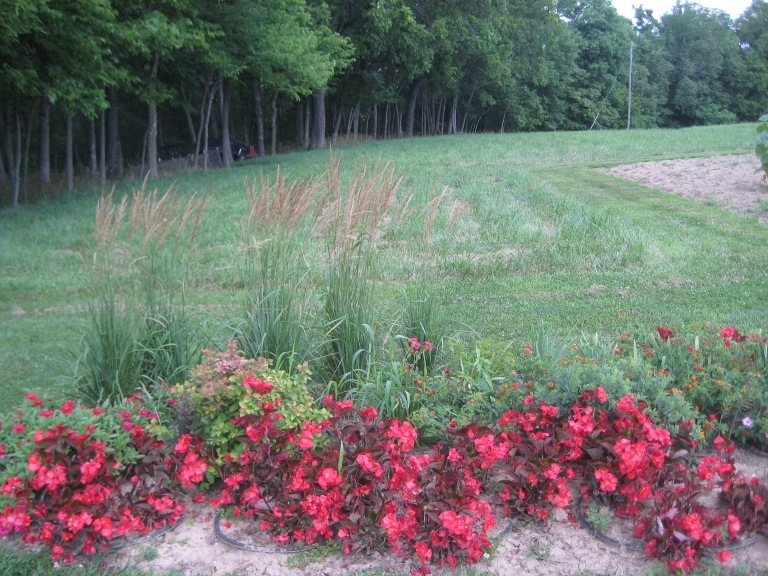 The shade bed (left) is likewise looking pretty good. 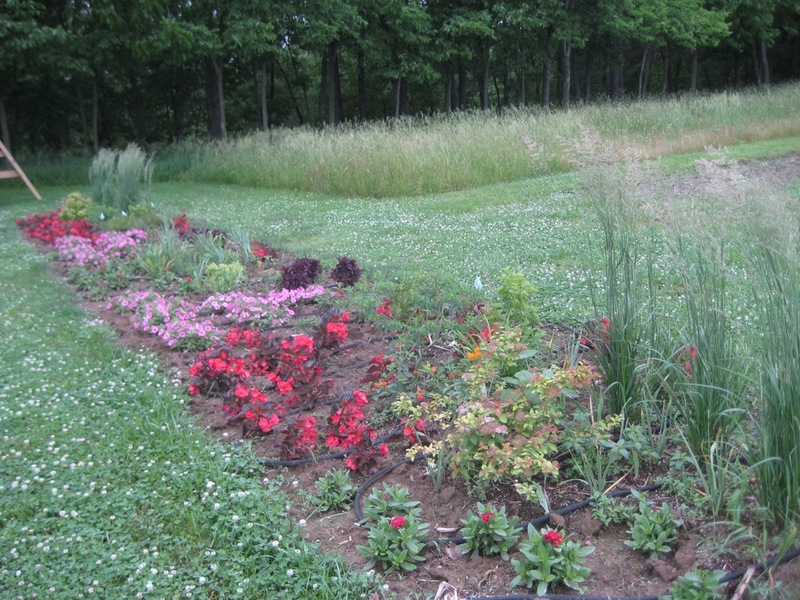 I do have few bare spots, but now that I've completely redone the large bed (right), which I reworked last fall, I can work on the shade bed this fall. I want to add some drought tolerant ferns, for one. The large bed, is also looking pretty good. 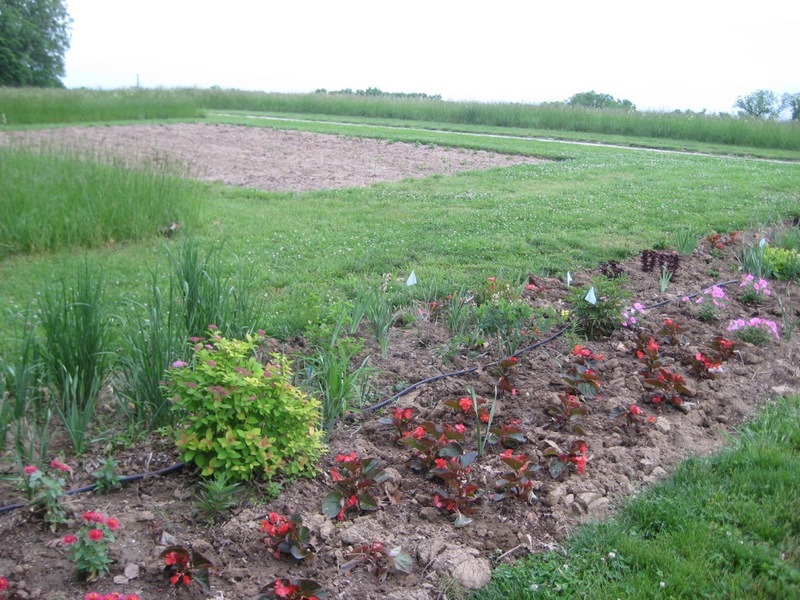 It was the last bed planted, by next time it should be looking great. 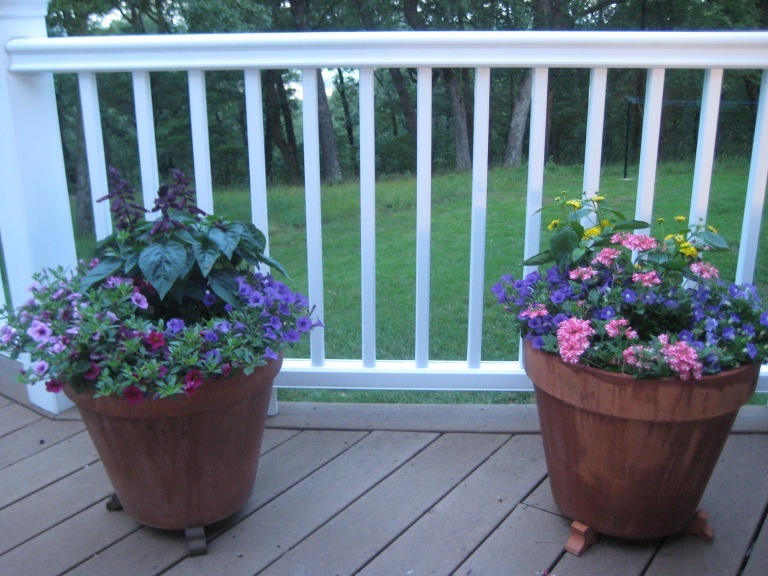 I planted the first two containers on my deck this past weekend. 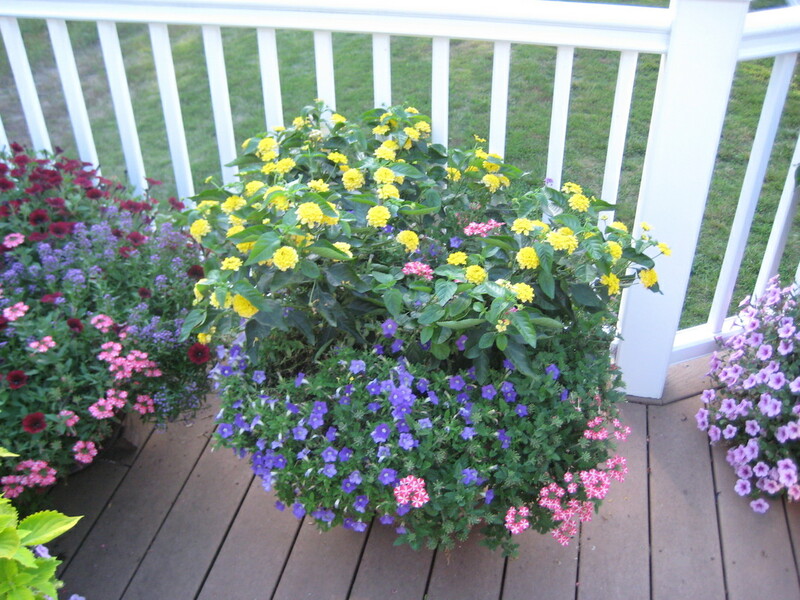 As is usual, my containers feature new varieties that won't be available at retail garden centers until next spring. I'll write about them regularly, so you can get a bit of a sneak peek. Just today I received two more boxes of new items. I'll get them planted up sometime this holiday weekend. I'm excited to see how everything does. Miranda has been helping me with the garden this year, although at not quite 3, i think she is mostly interested because there is water involved! She picked out some veggie seeds to plant - radishes and carrots. She poured the radish seeds all in one spot. Then when I picked them up and put them back in the dish, she immediately poured them all in a new spot. They came up really good, too. I need to go massively thin them out. After that I went ahead and let her watch me while I planted the carrots! The photo on the left is by the stairs near the door to the kitchen. Most of this bed has been in-place for close to three weeks, and ist getting nicely settled. I'm getting some decent flowering. In this bed, I have 3 Luscious® Citrus Blend™ Lantana, 3 Snow Princess® Lobularia and 10 Zahara Double Cherry Zinnia. 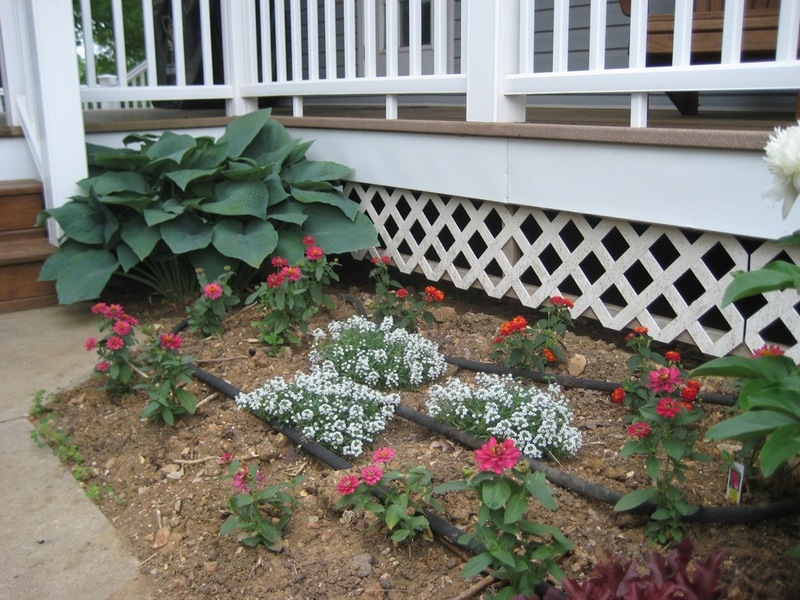 The photos in the middle and on the right show a bed that is primarily perennials. 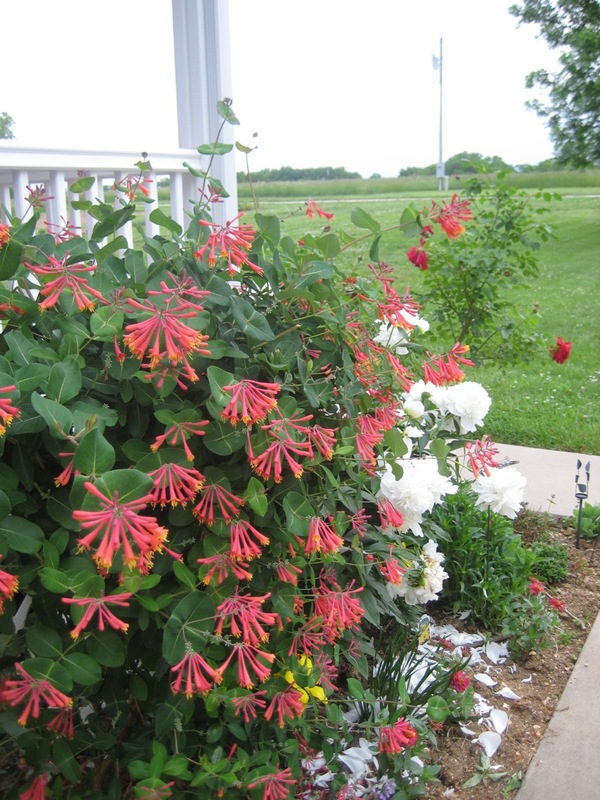 The honeysuckle is in full bloom and is putting on quite a show. I've started to see the hummingbird on a regular basis, it is nice to have her back. 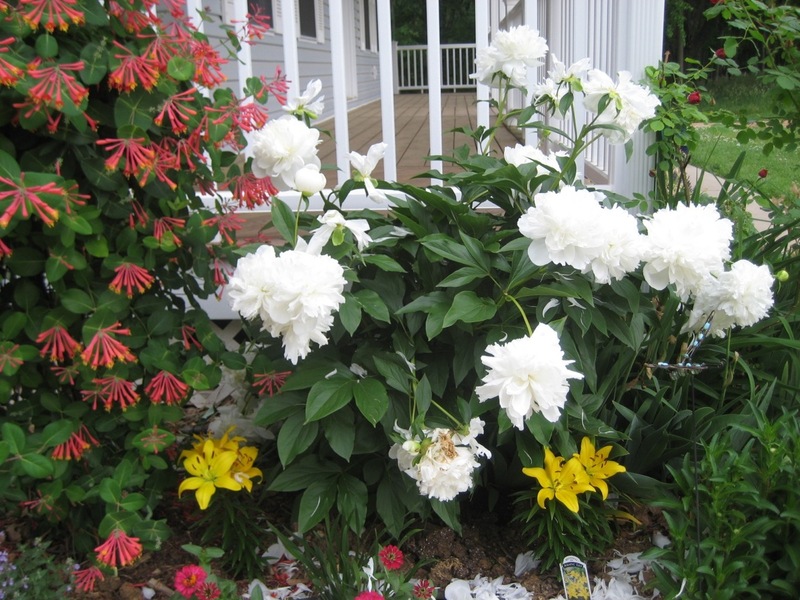 The Peony is also in full bloom, and the bright yellow lily you can see is Lemon Pixie oriental lily. Miranda picked out the non-blooming plants at the garden center. They just started blooming and the yellow is such a fantastic color of golden yellow. 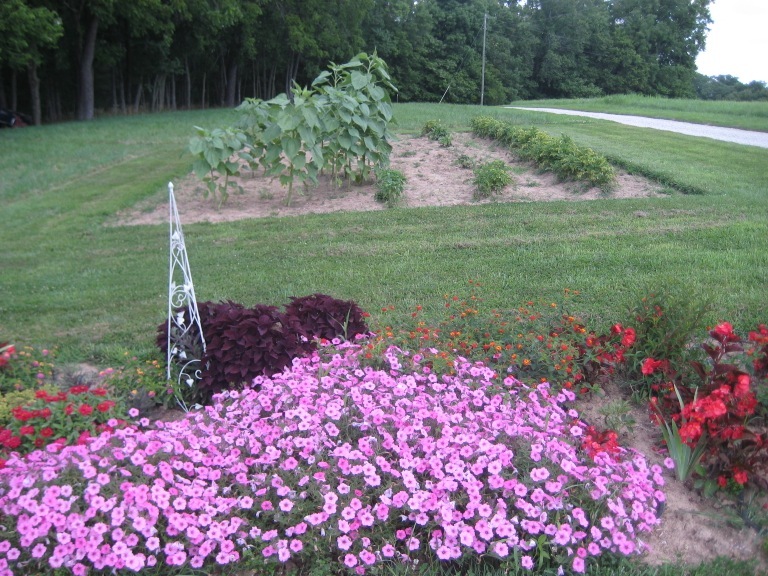 I used the same zinnias in this bed and the deep cherry-pink is set off greatly by the color of the lily. I love this combination of colors! These two beds flank the front steps. The rosebush my grandmother started began blooming this week, I love how fragrant it is! The bed to the left of the stairs is challenging because it is only 3 feet deep, but quite long. 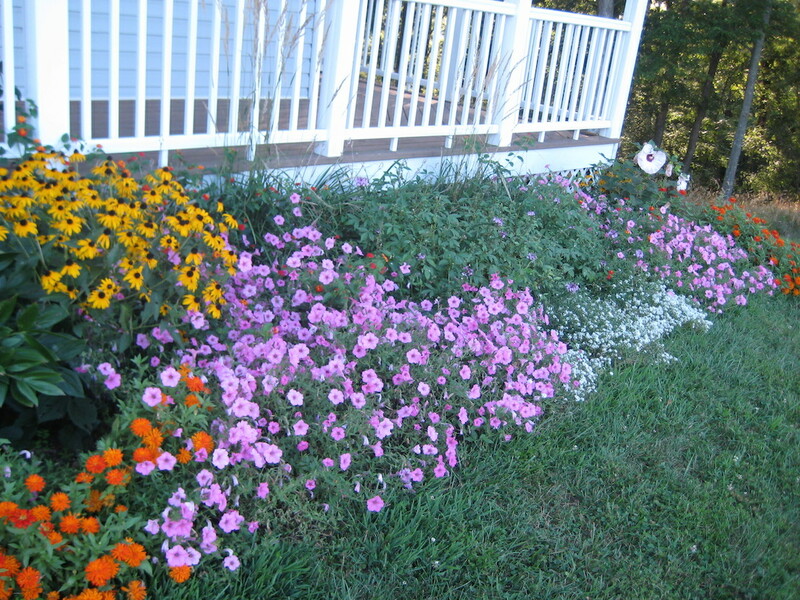 It is mostly perennials, but I did tuck in some zinnias, to add bright, but not sprawling, color. 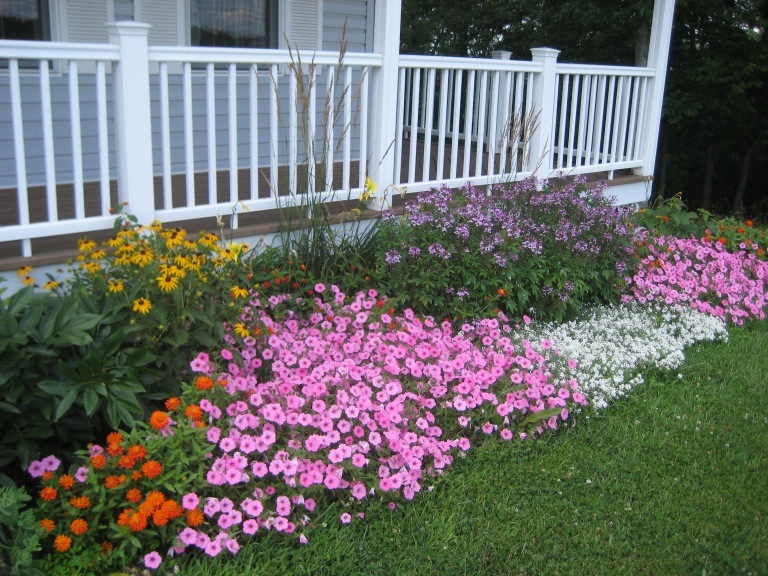 The bed to the right is a much deeper bed, I have repeated the zinnia, Luscious® Citrus Blend™ and Snow Princess®, but I added 3 Senorita Rosalita® and 6 Supertunia® Vista Bubblegum™ Petunias. The shade bed is coming along. I really do need to get something added to fill in between the Hosta at the edges and the Dream Catcher™ near the center. 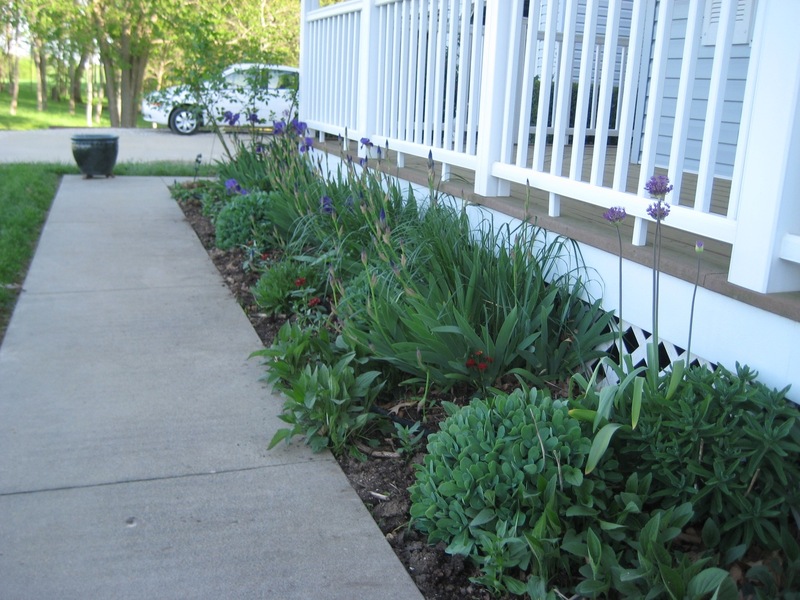 I want to add some drought tolerant ferns (yes, there are drought tolerant ferns) and hellebores. It is too late for this year, but fall will be a great time to add them. This is my largest bed and used to be backstopped by a 50 foot hedgerow, the plants didn't make it through the extreme drought from two years ago. Last fall I completely reworked this bed, removing every plant except 6, dividing and replanting some perennials and generally rehabbing, something that was necessary after 8 years. 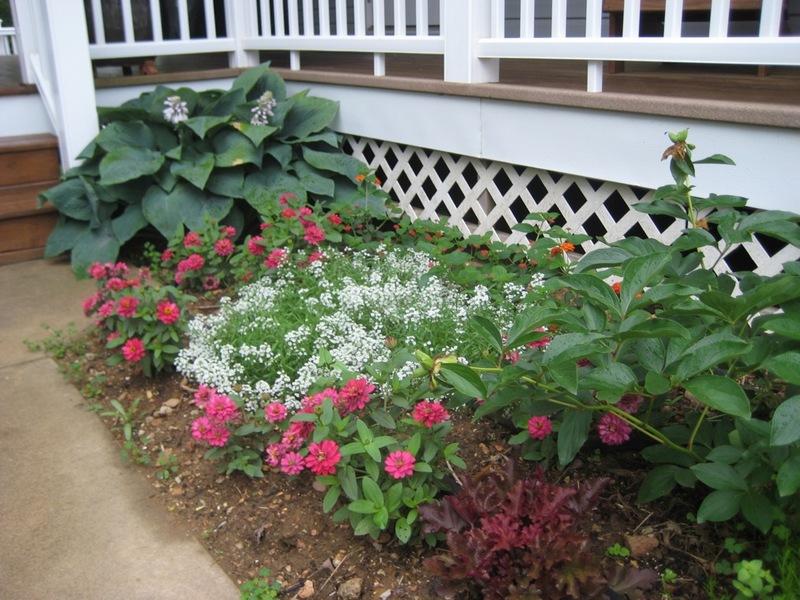 My next goal is to go out and get close-up photos of sections of this bed and detail which plants I've used. For now, let's just say I finished planting on Tuesday and I'm happy to be done. I'm really excited to see how this bed develops. It'll take a few weeks before the ground beds fill and really start to shine, but I think they'll be gorgeous! Last weekend, I did my first planting of the spring. 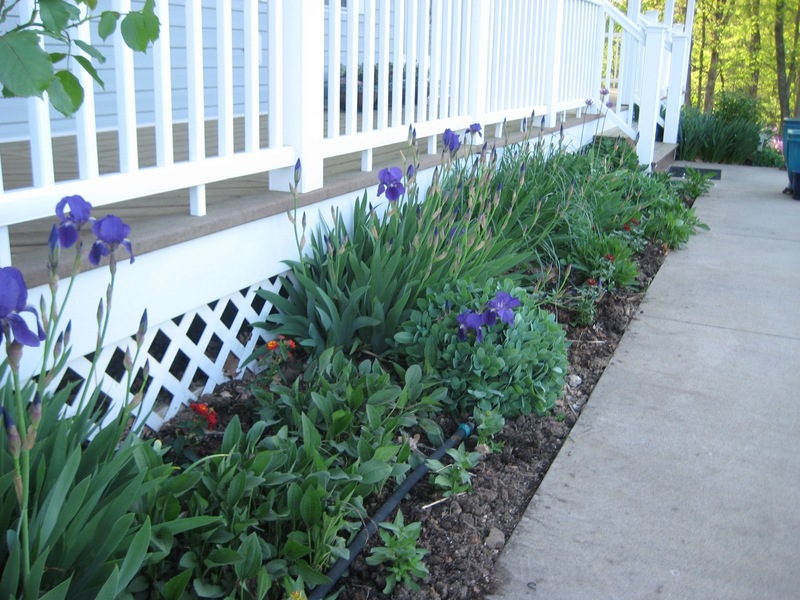 This bed by the kitchen steps is almost planted, I need a few fill-in plants, but it is almost there. 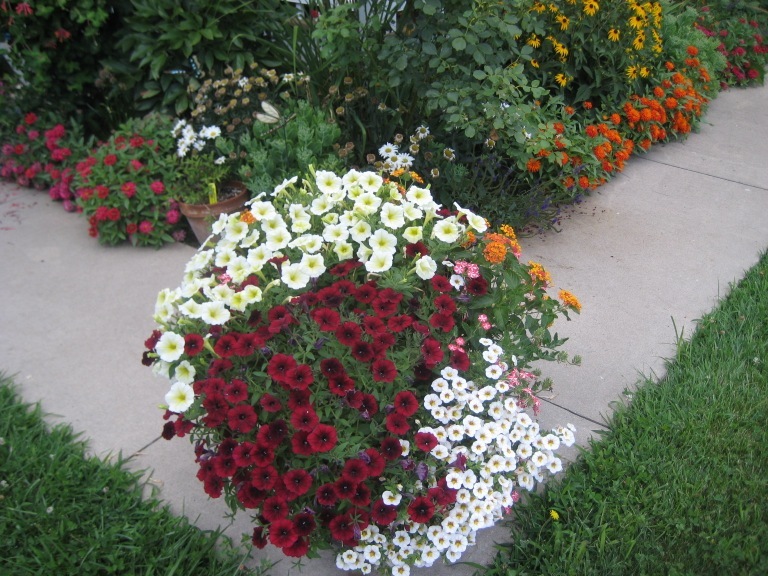 Right now there are 3 Luscious® Citrus Blend™ Lantana, 3 Snow Princess® Lobularia and some Zahara Double Cherry Zinnias. 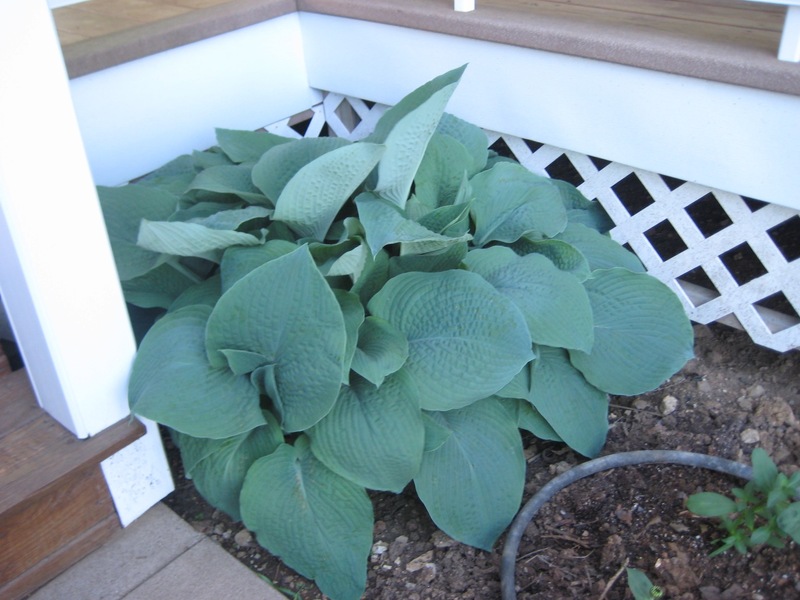 The hosta is tucked into the corner near the steps and is looking fantastic! I'm excited about this bed and can't wait to see how it turns out. This corner bed is really starting to show color. The Honeysuckle is now in full bloom and I've spotted the hummingbird for the first time this year. The Peony is just about to pop and start blooming. The Irises mom shared with me are in full bloom, too. 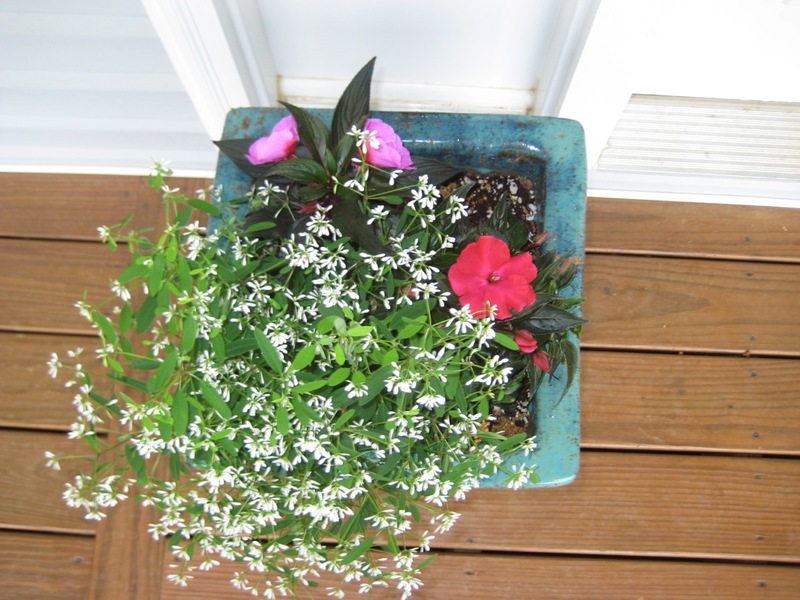 I just added two Oriental Lillies and some Zahara zinnias. I've been really working hard this spring to get compost added to my beds. 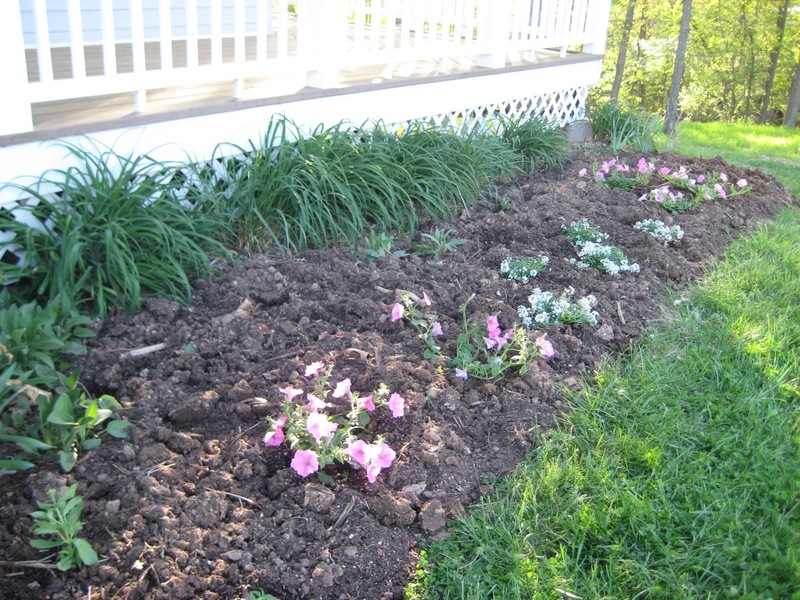 Just in these beds around the porch, I've hauled in 4 wheelbarrows of compost from the compost bins. New compost usually means the plants do especially well. 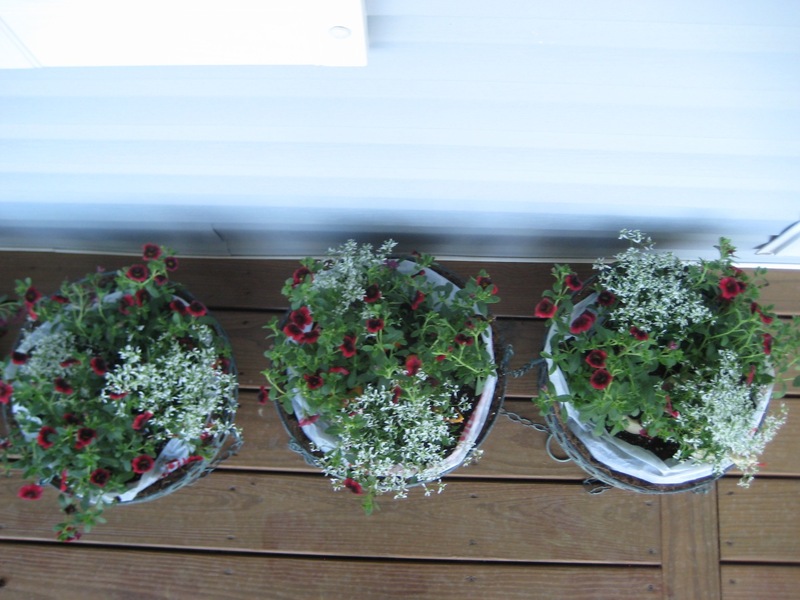 I also planted up the hanging baskets for the porch. 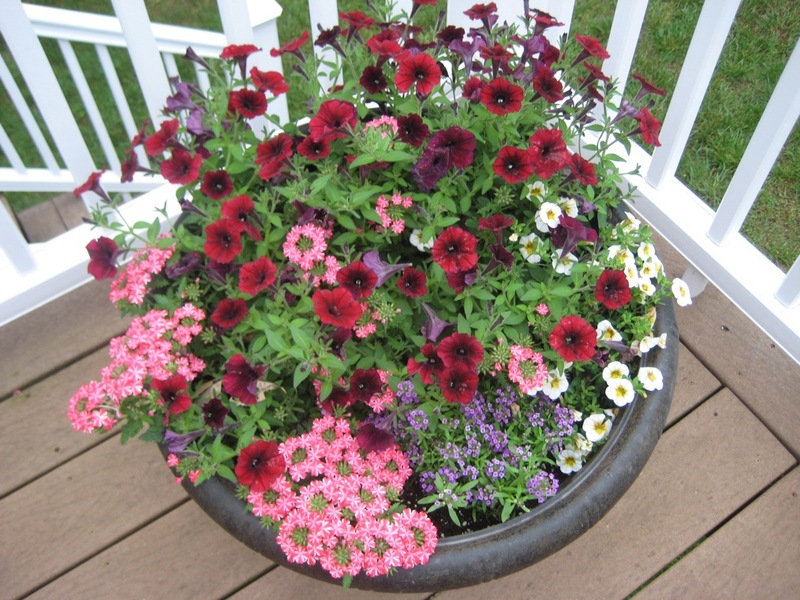 I was thrilled to find the brand new Superbells® Pomegranate Punch Calibrachoa. I added the white of Diamond Frost® to the deep red to get some good contrast in colors. 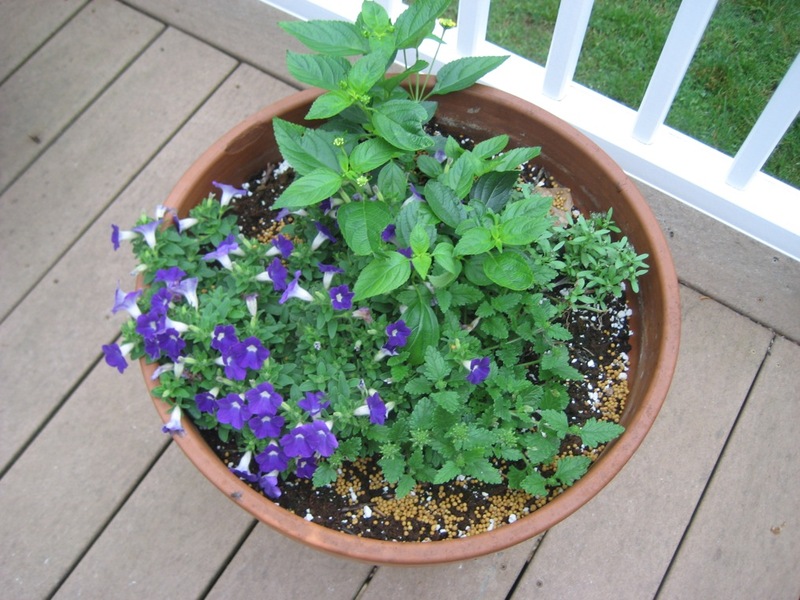 I usually use 3 plants in my baskets (they are 14" in diameter), but since I am using only 2 varieties, I used 2 of each - so 4 plants in each basket. I can't wait to see how well they do. 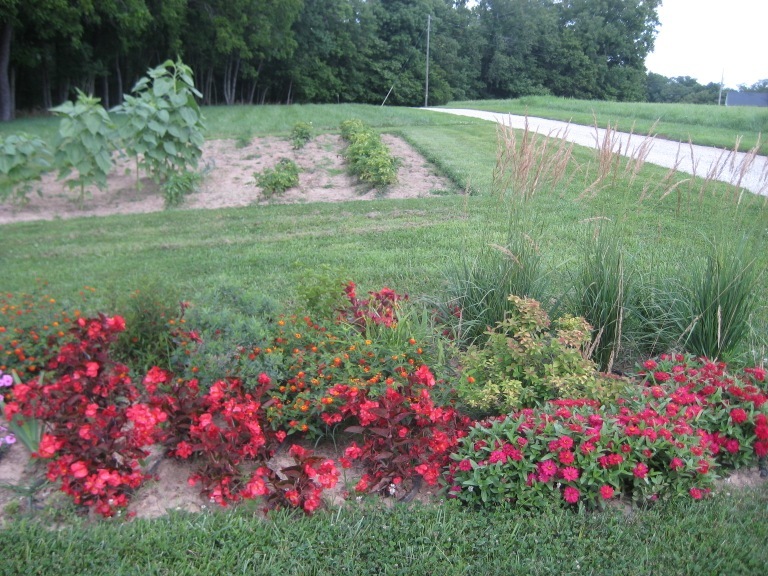 As usual, I added our Controlled Release fertilizer to the baskets (and the plants I put in the beds, too). That will really give the plants a good boost to grow well. What a difference a week can make! The two photos on the left were taken on Monday and the one on the right was taken this morning. We had very warm temperatures this week and some rain, so things have grown like crazy. This particular bed is completely finished and I have no plans to plant anything else. 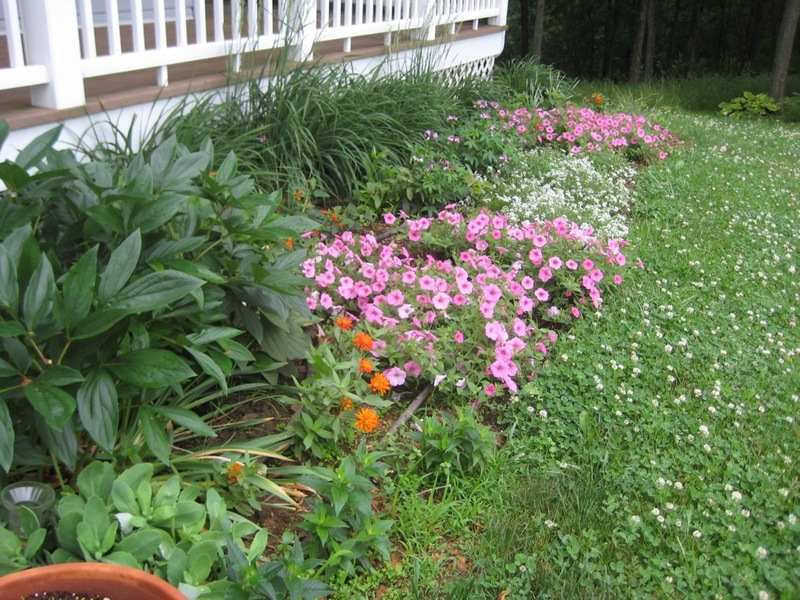 With the established perennials, I have just a bit of room for annuals. 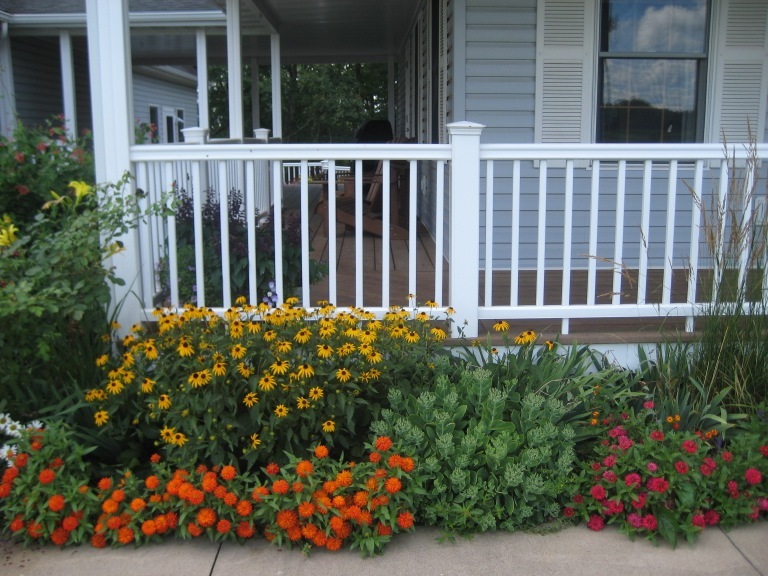 I used Luscious® Citrus Blend™ and Zahara Double Cherry and Double Orange zinnias. 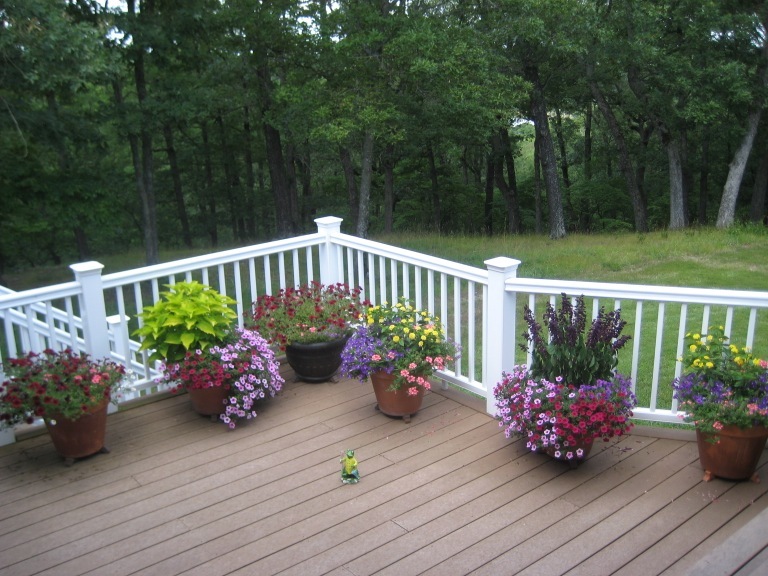 The red/yellow/orange colors will coordinate with the baskets on the porch. 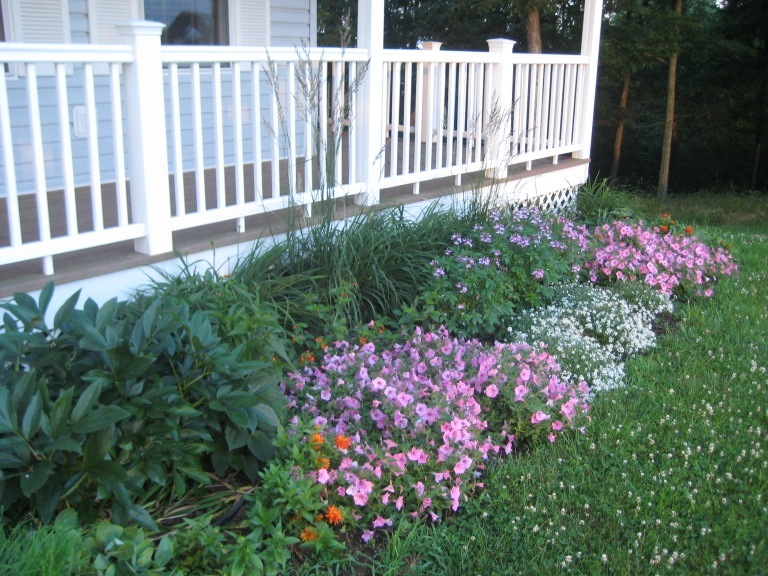 This is the last of the beds around the porch. I just have a few plants in this one. Snow Princess® and Supertunia® Vista Bubblegum are the two I have planted, so far. 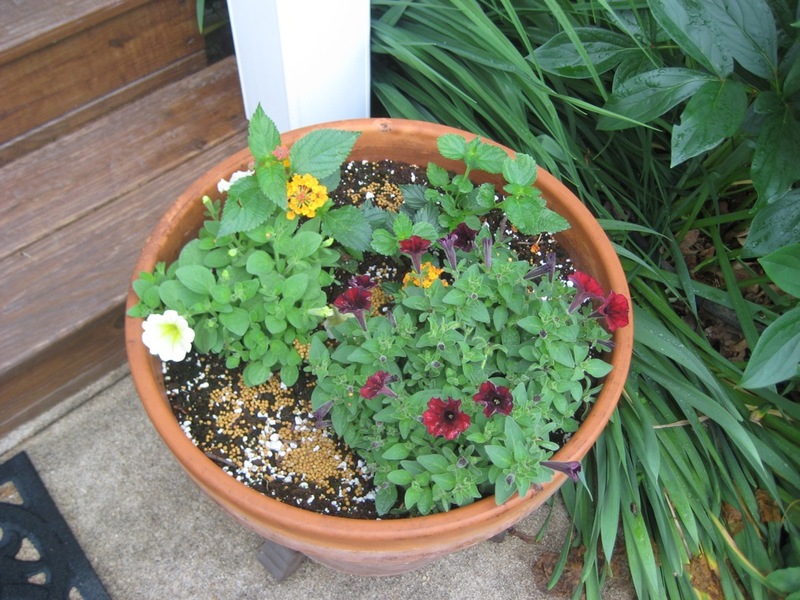 I am going to add some Luscious® Citrus Blend™ and zinnias before it is all said and done. I need to make another garden center run soon, but I don't see it happening this weekend, plus with an inch of rain over the past couple of days it won't be dry enough to plant anyway. 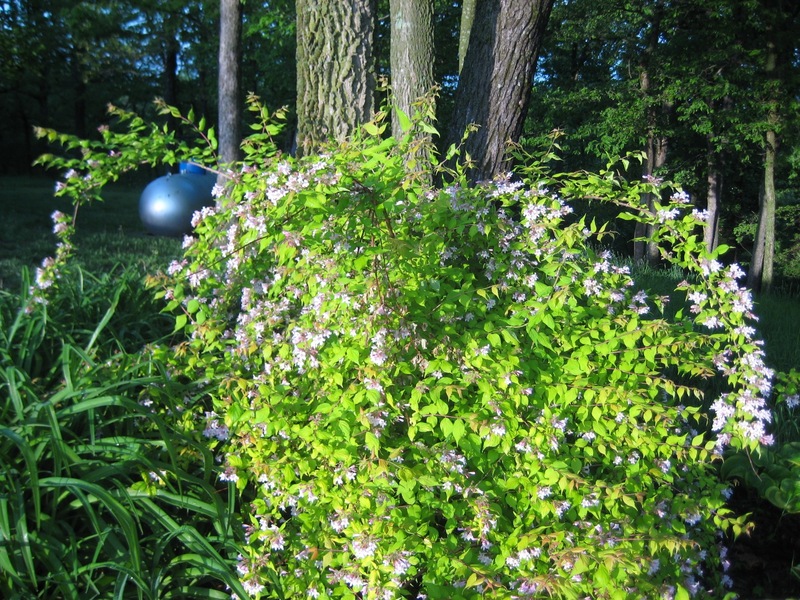 These last two photos are of Dream Catcher™ Kokwitzia which is planted in the shade bed. I took this photo this morning and the plant is currently in full bloom and looking great. It took it a few years to get well-established and get its roots established among the tree roots, but the past few years it has been really a great performer. I went out this morning as the sun was rising to snap a few photos of the garden and the surrounding landscape for this article. I thought you might enjoy seeing our sunrise. Not an especially colorful one, but pretty never-the-less. 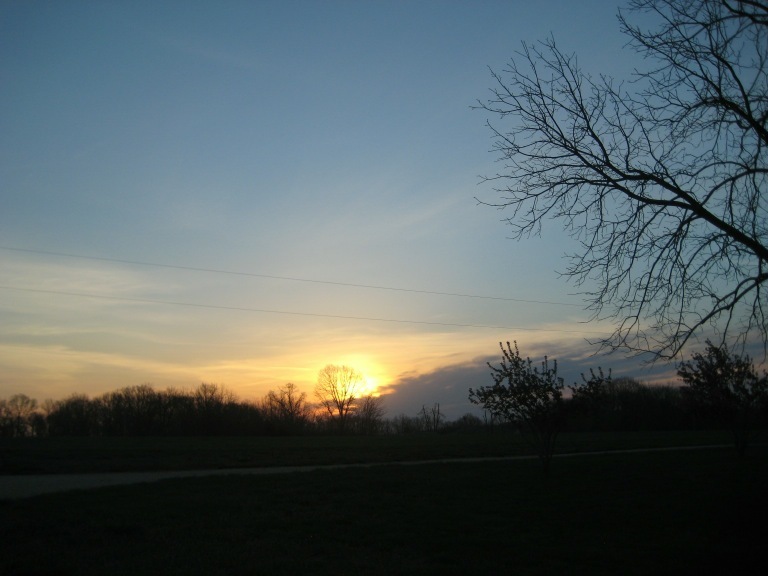 I am blessed to have a great view of the sunrise from the front of the house and sunsets from the back of the house. My mom has always loved sunsets, even though from their house the sunset isn't usually visible. 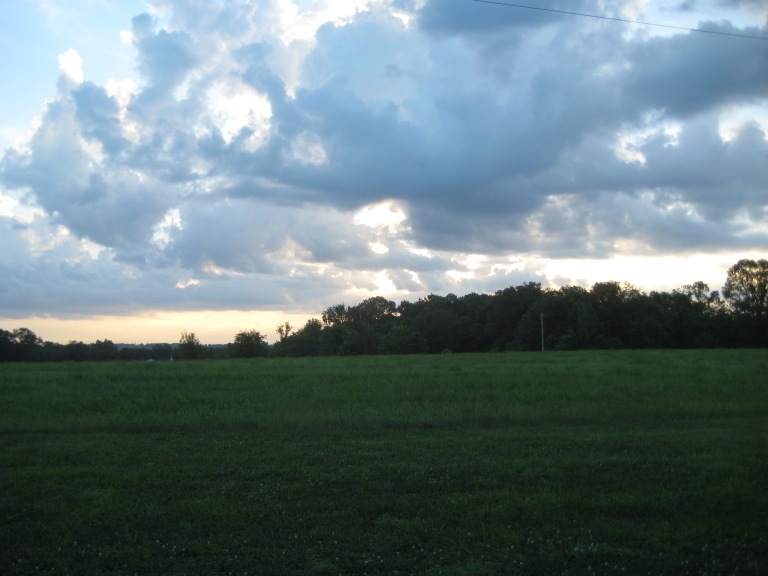 She instilled that love of the sky in me and I am working to give my daughter that same love. This winter the sunset was usually visible as we drove home from her daycare and she has come to love the sunset. Hopefully that continues. 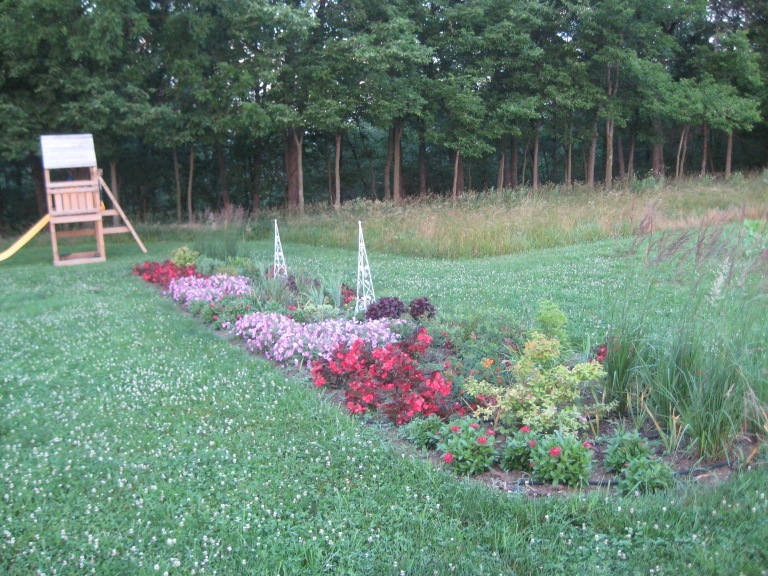 Ok, on to garden photos. 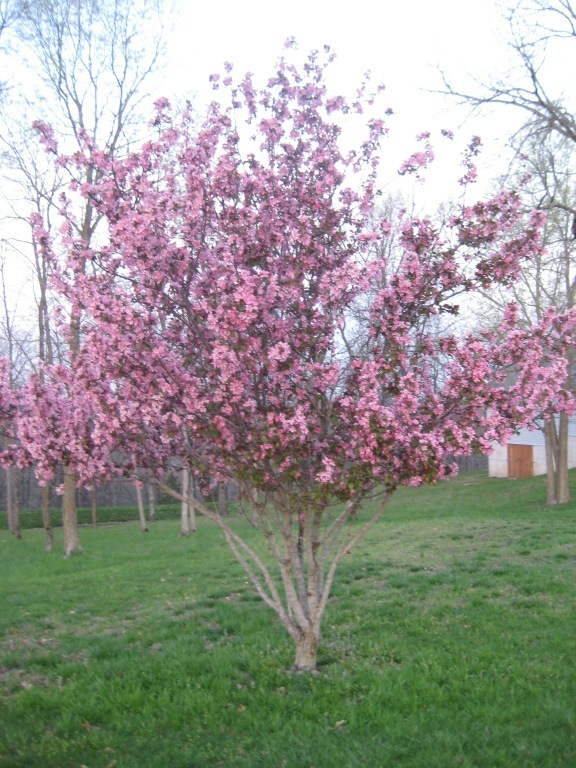 From left to right, one of the two crabapples in our yard - looking really great. 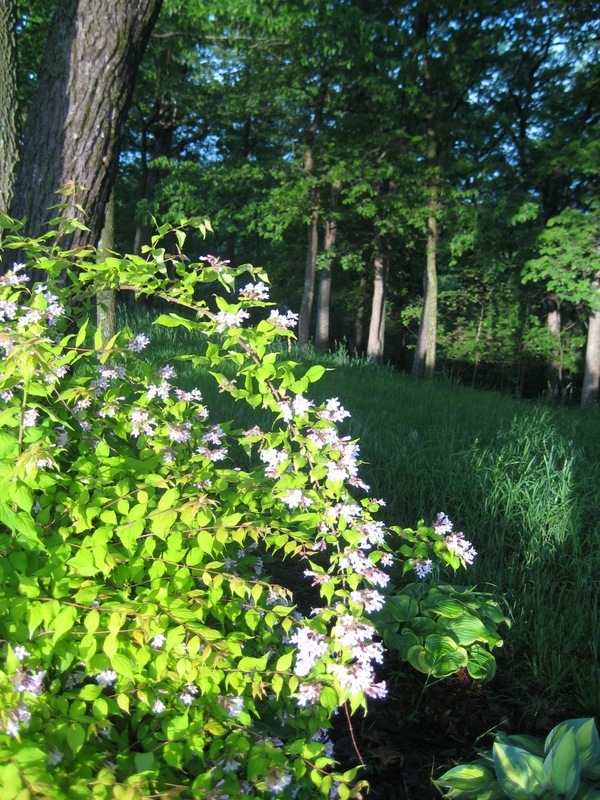 The two other photos are of the native serviceberry trees that grow in the woods around the house. 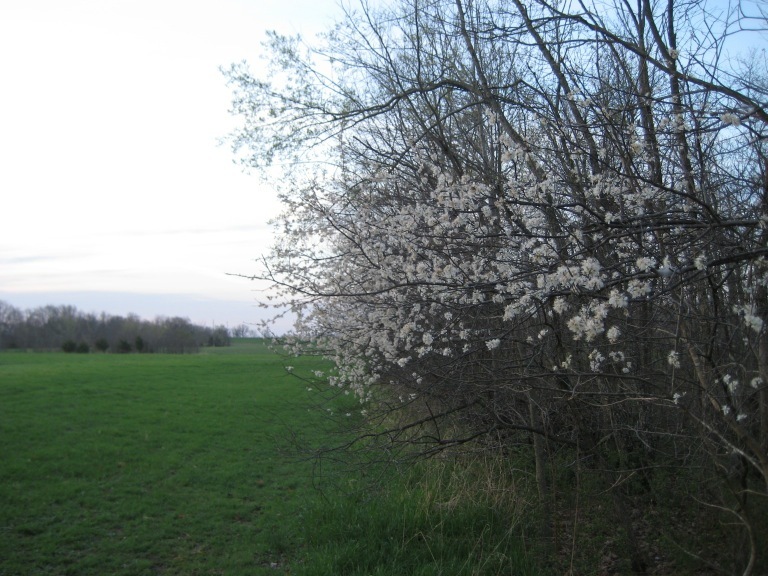 I think most people probably mistake them for dogwoods (also native), but dogwoods come into bloom after the serviceberry are done. 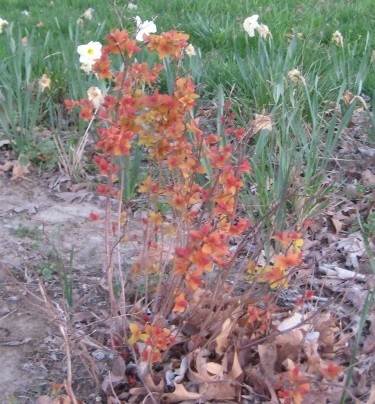 A few of my shrubs have started to leaf out including both of the Double Play® Big Bang Spirea I have are leafing out with their bronzy-orange foliage (left, above) and Dream Catcher™ Kokwitzia (right, above) which after over 5 years in the landscape is well-established and flourishing. 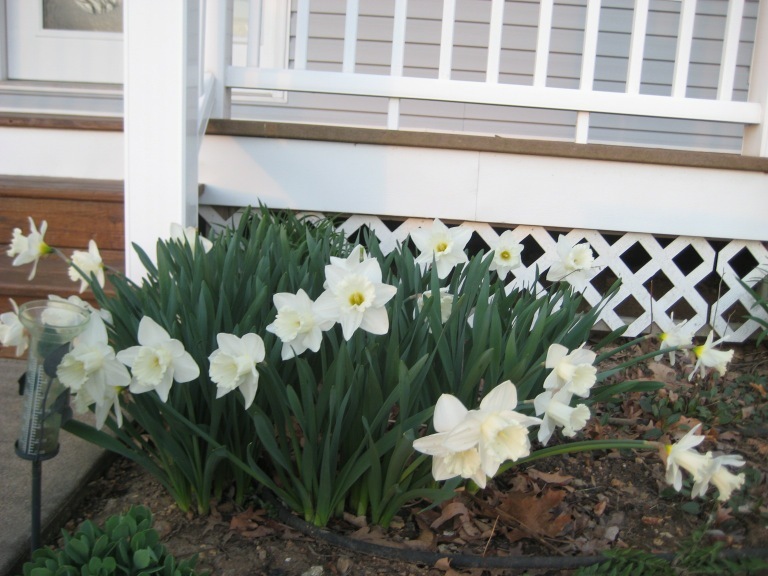 The daffodils were in full bloom earlier this week, but a dip into the 20's a couple of nights ago helped many of the flowers prematurely age. 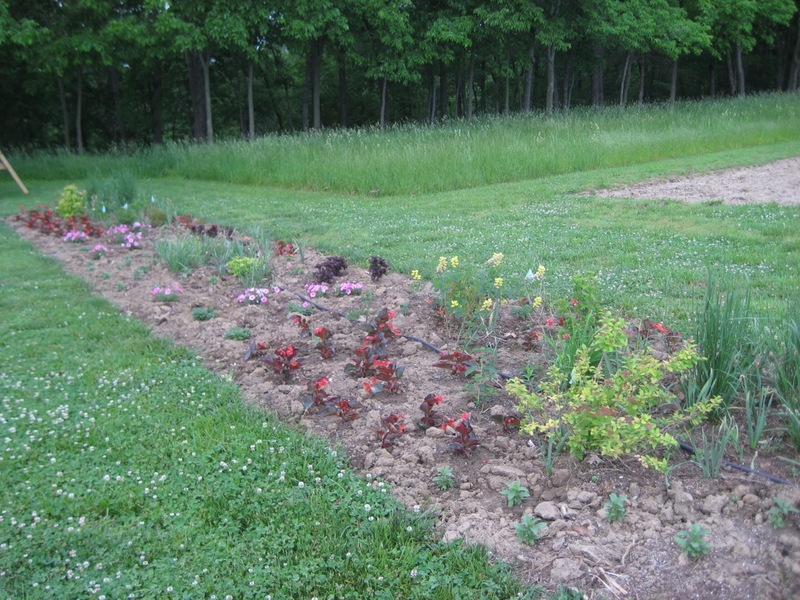 I do have many of my perennials appearing, with the peonies up several inches already. I am looking forward to the color to come with those items. Miranda loves to pick daffodils and we've had bouquets in the house on a regular basis. I am trying to teach her to pick them with a long stem, instead of just popping the flowers off. It's a learning process, so it isn't unusual for us to have a few with long stems and then flowers floating on top of the water in the jar. They keep quite well when floating in water, so I learned something new. 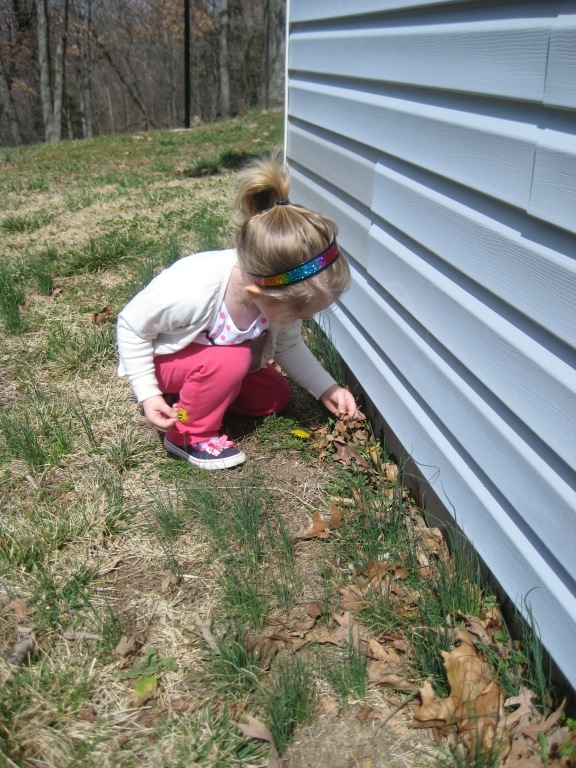 The photo is of her picking dandelions, which to her are every bit as pretty as daffodils. I do usually manage to "lose" them before we get back inside to the vases:-) What passes as our "lawn" in the back is looking worse than usual. We are seriously thinking of having top-soil hauled in since the back is a thin layer of soil over bedrock to try and get an actual lawn back there. One of the great things about gardening is the wildlife you attract to your garden - bunnies and deer excepted. The flocks of robins that migrated through are gone by now, but we are still seeing many birds. In fact, I am pretty sure a cardinal pair have built a nest and are protecting eggs in the holly bush that grows between our main walkway and the garage wall. I see the male cardinal more often than not when I walk by. I have resisted the temptation to really seek out the nest, I don't want to scare the birds into abandoning their nest. I'm looking forward to seeing what this season brings. My daughter and I spent a recent Saturday raking leaves out of flower beds and hauling them to the compost pile along with a few other garden chores. In other words, it was a great excuse to spend a few hours outside in the sunshine and warmth of a gorgeous early spring day. 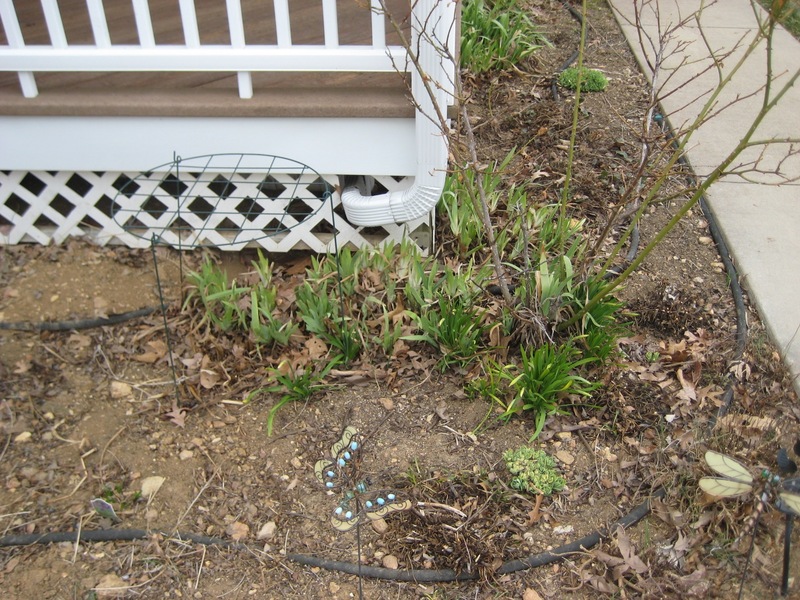 Once I saw the golden yellow daffodil foliage we unearthed (they've turned green now, but the photo on the left did have golden yellow daffodil foliage), I realized we were a couple of weeks late in getting the plants uncovered. Nevertheless, Miranda deemed them "flowers" and picked the foliage, which she then felt the need to lick. I made her stop and yes, I did google "are daffodils poinsonous to kids". The results? They are, but they are much more likely to give you a tummy ache - and all the other symptoms that can entail - than kill you. Not that I'm going to let her chew on the foliage in any case, but also not worrisome enough to freak out about. I was also reminded that beauty is in the eye of the beholder. She asked for flowers and I told her it was too early for flowers, thus her deciding the golden foliage counted. 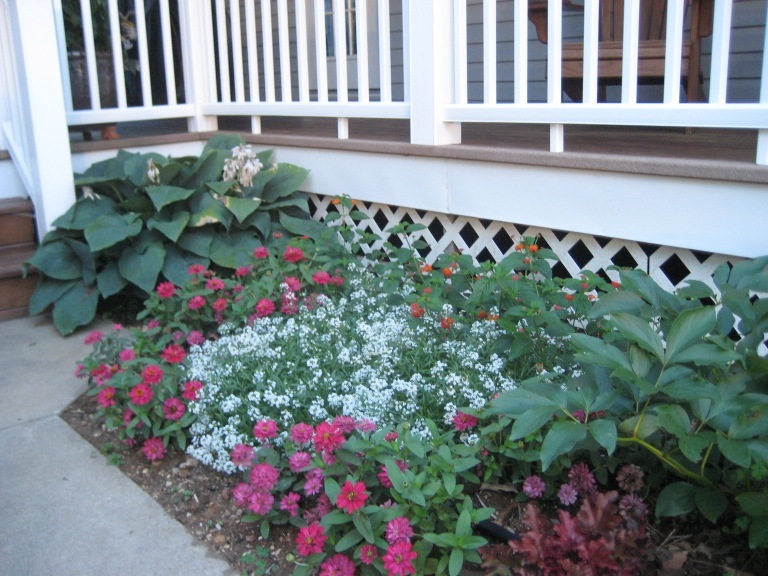 Then I got to the part of the flower bed with the dried sedum flower heads and realized, I do have flowers. 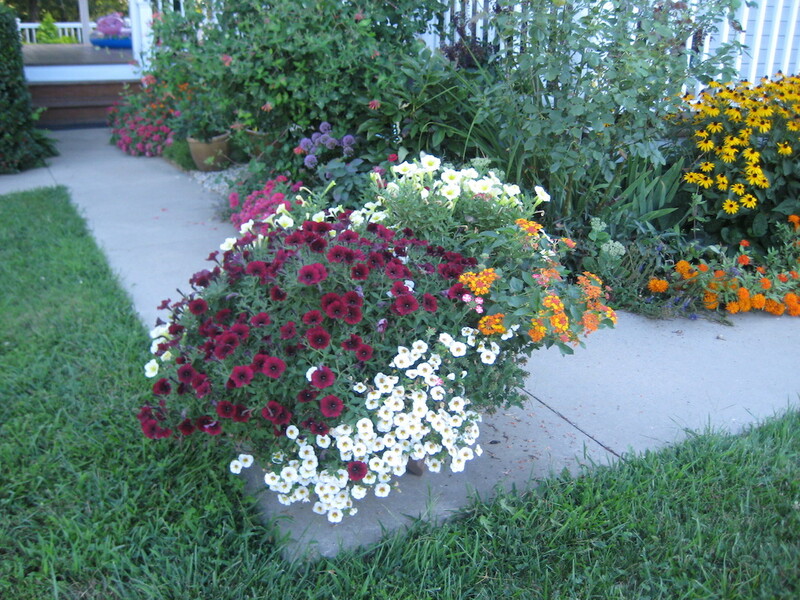 She filled buckets with them and the dried Black-eyed Susan seed heads. Flowers indeed! We both ended up with a few scrapes where the rose bush reached out and grabbed us and I have had to remove splinters from her fingers 3 times in the last couple of weeks. The first time she sat really still and I gave her a Sesame Street band aid. My band aid stash is dwindling quickly now that she has realized they are "pretty." Unfortunately, she now also realizes that getting a splinter out can hurt, so is much more reluctant for mom to get them. I told her if we didn't get it out, we would have to go to the doctor. Her response? Let's go now. Hmmm, that one backfired on me. I did prevail in the end and all owies are now pretty much healed. 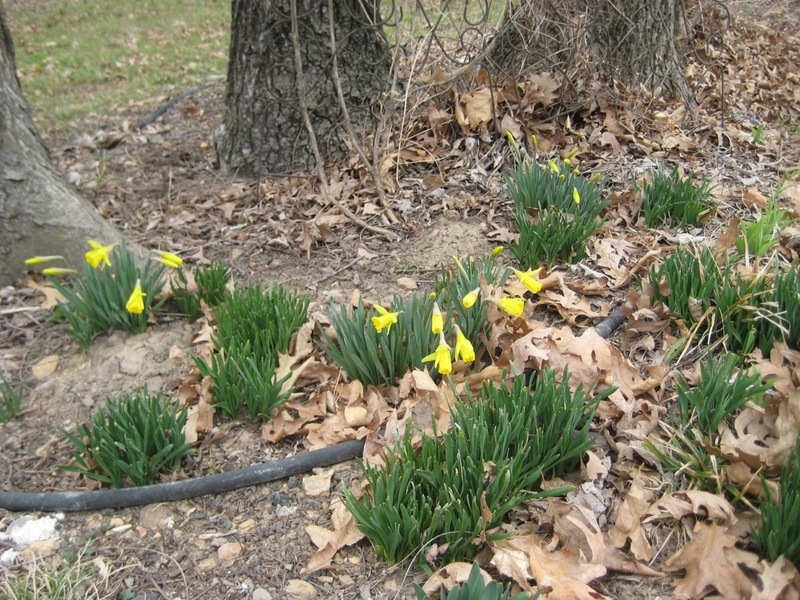 Even better news, my first daffodils are about to bloom (see photo on right). Unfortunately, I will not get to enjoy the Forsythia this year. My honey has hated that bush since we first moved in and managed to successfully remove it because Miranda's play-house/slide/swing set was going in the spot where the bush was. I suspect ulterior motives on his part when planning play-house placement! 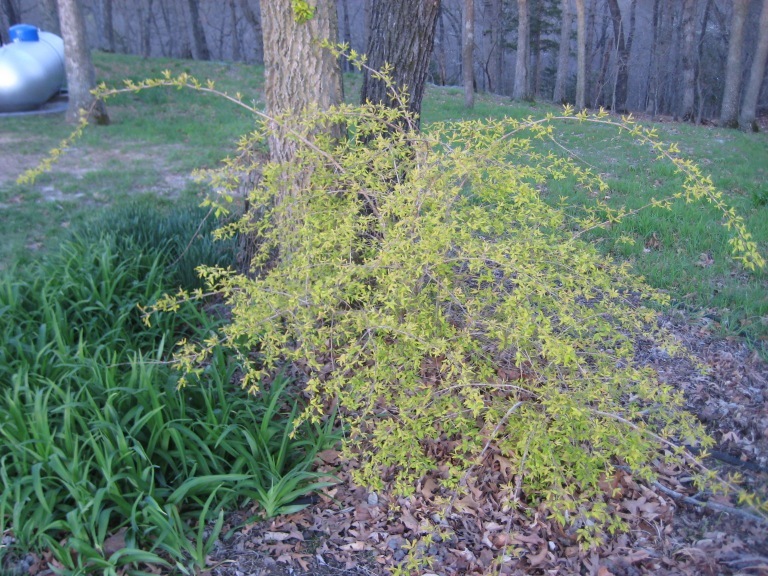 Nevertheless, this spring I plan on planting one of the Show Off® Forsythia that we sell. 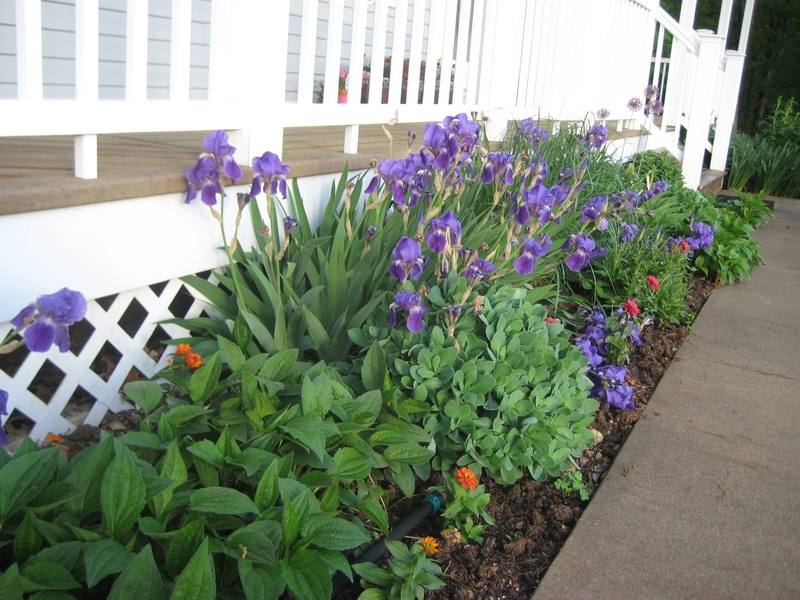 They are more compact and will be able to live in my mixed border bed rather than the middle of the yard. Although I have yet to decide which of the three I am going to plant. I have the feeling I will end up like Goldilocks, choosing the mid-size one as just right! Lovely gardens! I really enjoy your entries. You girls must be very busy!! We are busy, but it is a good busy! Simply beautiful! Nothing more needed to be said! Thank you. I try and just remember you never see the chaos that is just behind the camera! Thanks for the suggestion. I've been considering it and hadn't yet made the choice to try it. I am going to try to plant Hellebores this fall, they are great for that type of situation too! I look for a ration somewhere around 2:1:2 or 2:1:1.5 - so a 20:10:20 or a 20:10:15. Usually every 7 to 10 days will be recommended on the label - but in any case, follow the label instructions. 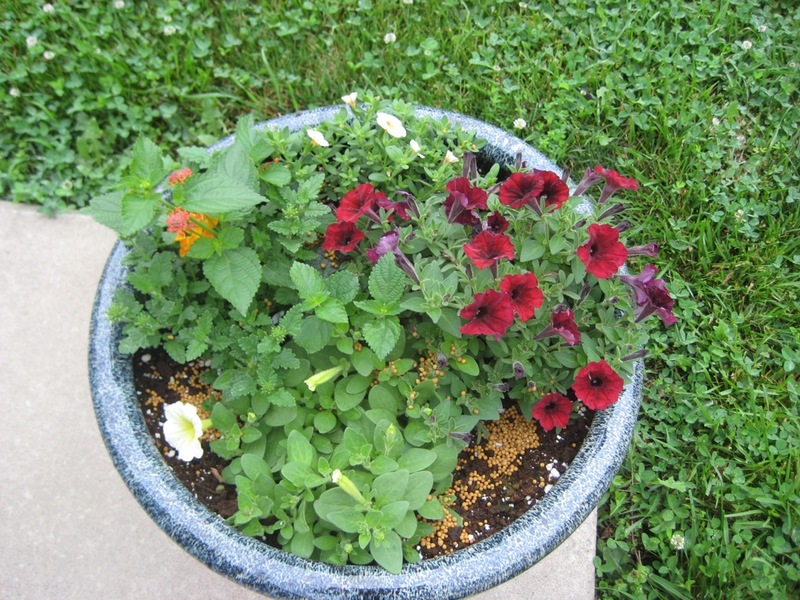 For more info on choosing a fertilizer, this link might help https://www.provenwinners.com/learn/feed-me-seymour. 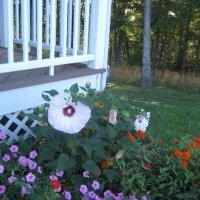 I was reading Kerry's Garden and went to click on flowers in her containers and received a message that I was not allowed to access content. Prior to this, I was able to click and access everything with no problem. Can you help please? 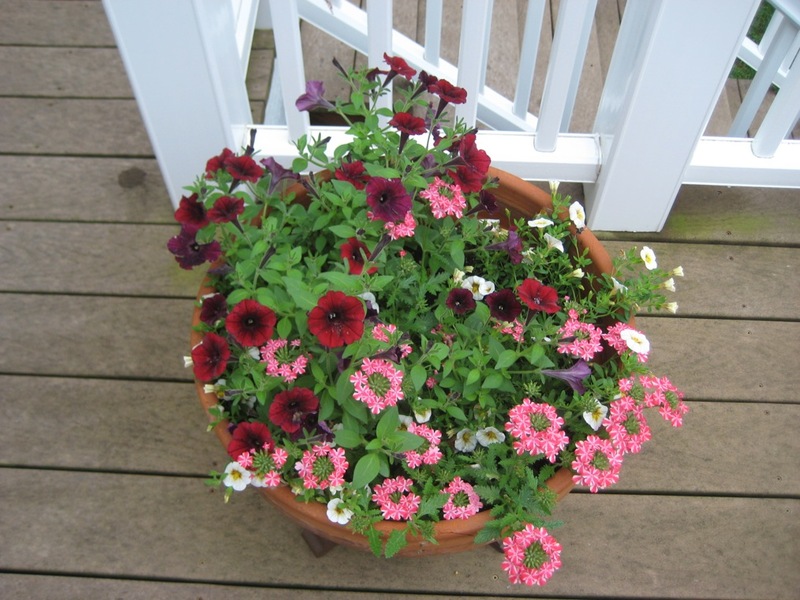 The flowers in my containers are not avaialable to home gardeners yet, so they aren't available on the website yet. We didn't have the permission levels set correctly at first, so the links worked. 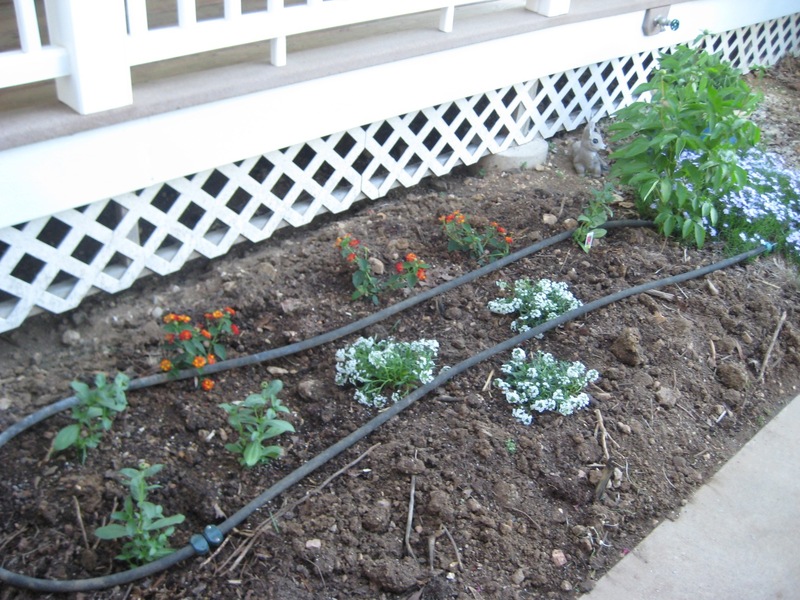 The plants in my garden beds are plants that are on the market and those links should work. I shouldn't have included the links, I'll try to go back and remove them until they are available on the hoome gardene side of our website. I try to think of my garden as a work in progress. There is always something for me to do. The main thing is enjoying your efforts and the results. I do pretty much every bit of work myself and there are times when things are a weed choked mess and other times when things look pretty great. It really is a home garden and I try to make sure to show the great parts and the not so great parts. I'm glad you enjoy the photos!